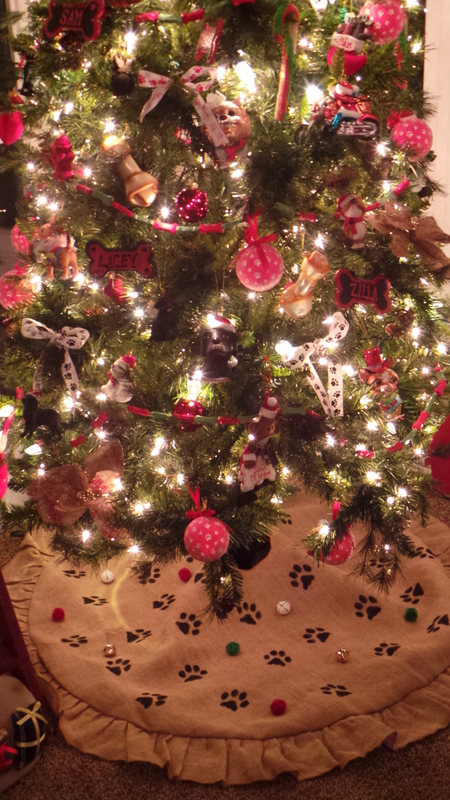 Our pets are a big part of the holiday festivities…they even have their own pet themed Christmas tree. 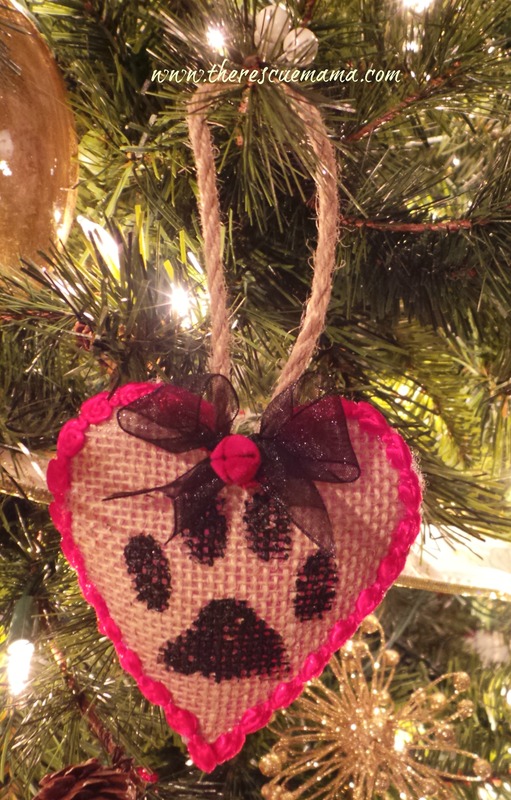 I made these sweet little burlap paw print ornaments this year to go with the Paw Print Christmas Tree Skirt I made a few weeks ago. 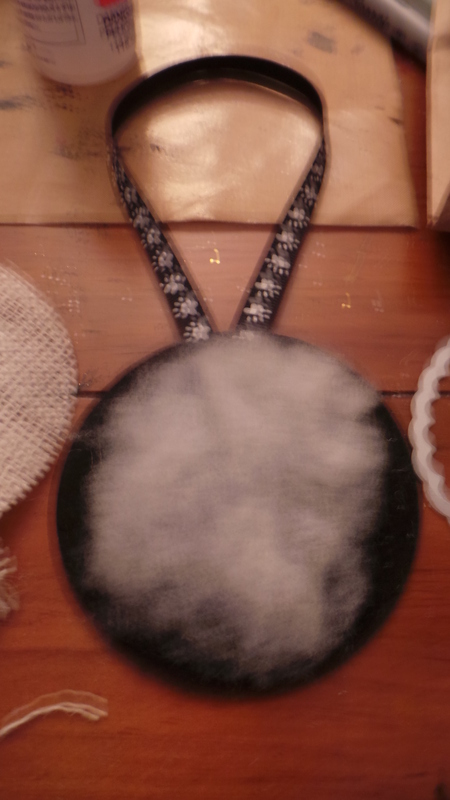 These ornaments were super easy to make and really inexpensive from a materials standpoint. To get my basic shapes for the ornaments I used die cuts for my Big Shot. I cut the front and back with the die cuts. I used burlap for the front of the ornament and stiff felt for the back. 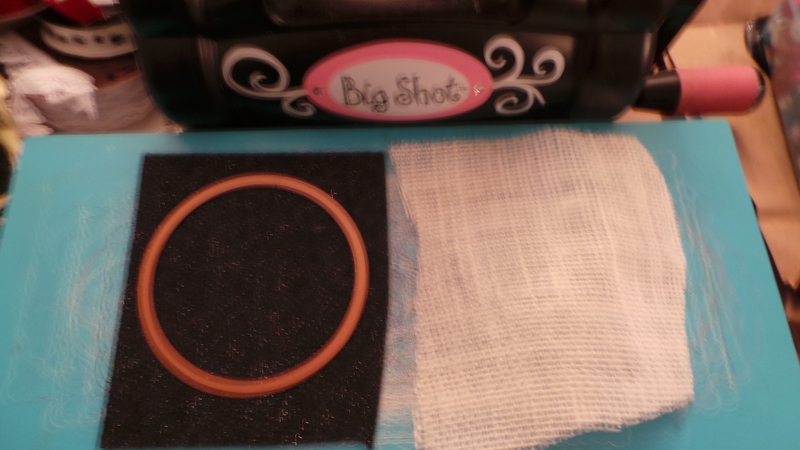 If you don’t have a Big Shot you could just as easily trace a jar or box on to your fabric and get the same result. 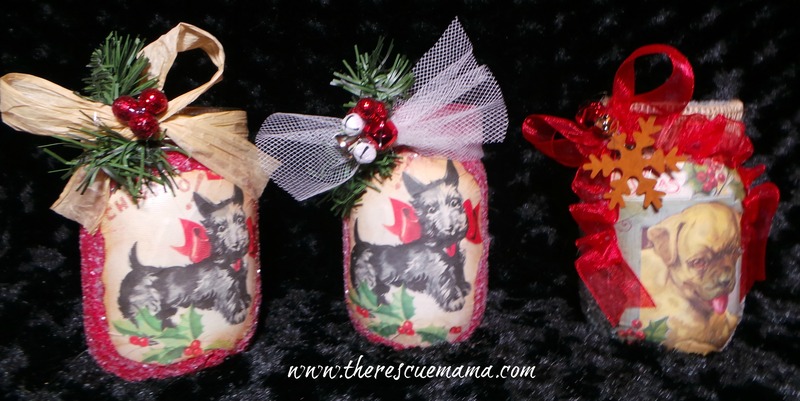 You could also make these ornaments with any fabric you like (thought you might want to stiffen it)…I have just been on a burlap kick this year. 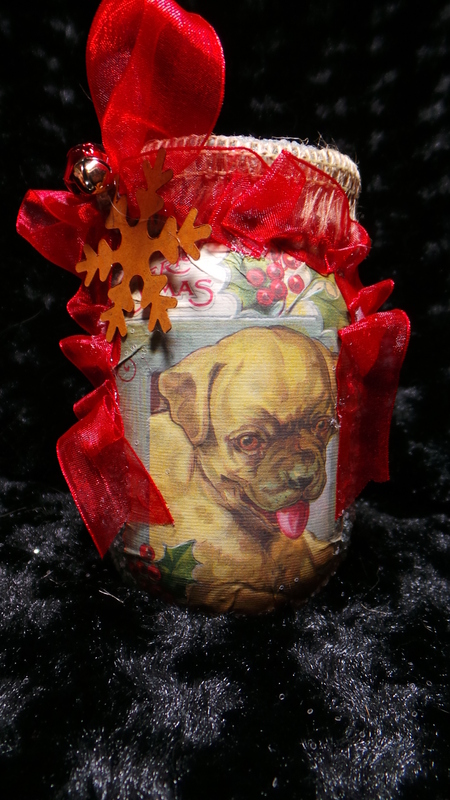 After I cut the front of the ornament out of the burlap I decorated it (painted it) before I glued it to the back. 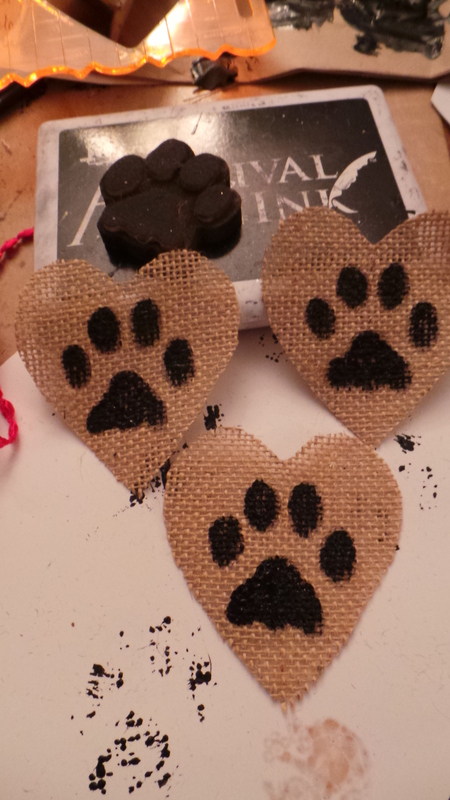 I kept these simple and used paw print stamps and black craft paint. 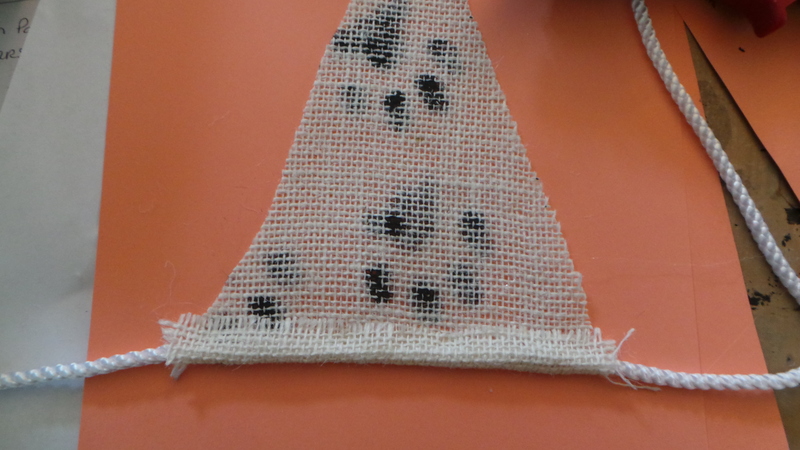 I stamped the burlap with Archival Ink and then went over it with black craft paint. Simply stamping on burlap will not get you a dark finished look. I use Archival Ink pads because they are permanent. Let your craft paint completely dry before moving on. I stuffed a small amount of stuffing in between the front and back of the ornament (just a bit) and glued it shut with Beacon’s. I prefer to use Beacon’s for projects because it has a good trade off between drying fast but not so fast that I don’t have time to re-position if necessary. I used ribbons and trims that I had in my stash to finish off the ornaments. I glued the ribbon that is meant for hanging the ornament to the inside of the back fabric before I put the ornament together. I added bows and jingle bells to the finished project as well. 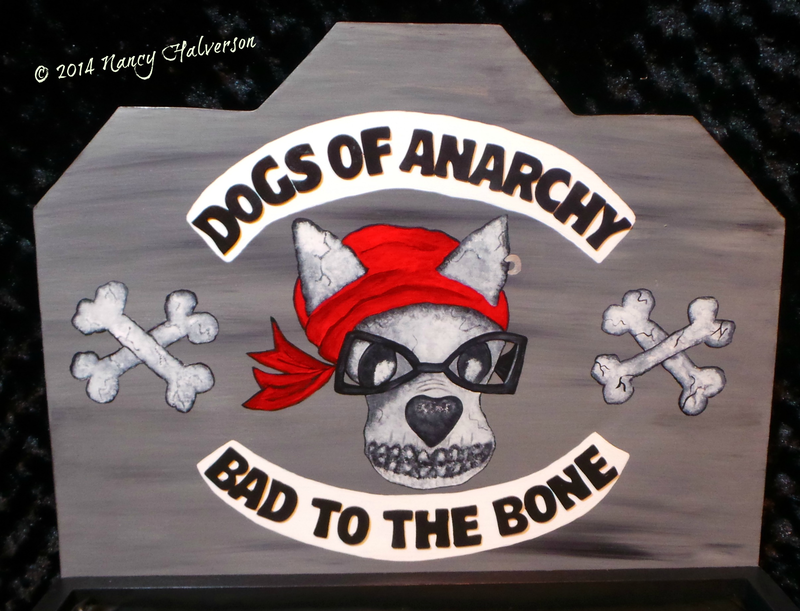 You could embellish with anything you want….holly, flowers, dog bones, etc. You could just as easily glue all this together with a hot glue gun as well. I was really pleased with how these turned out especially since they were so simple to make. I made all of these start to finish in one evening. 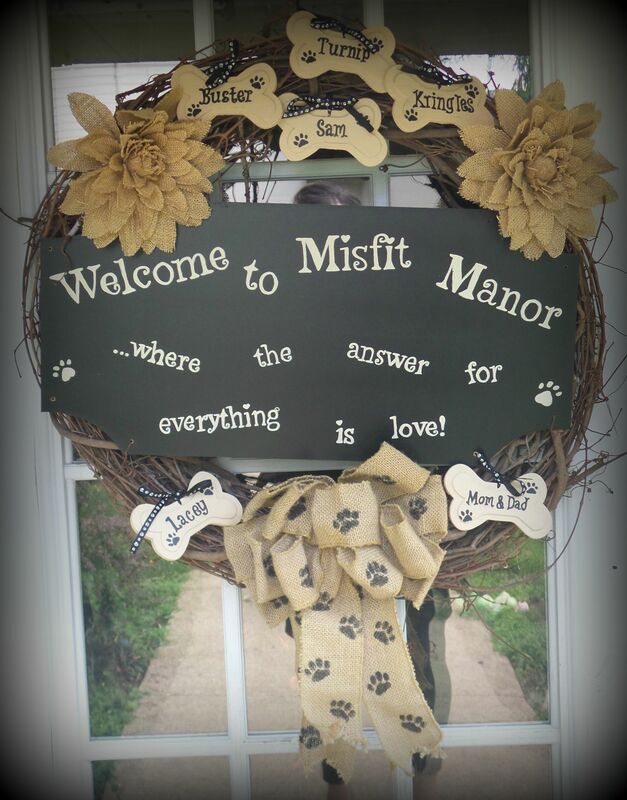 If you are a pet lover and crafter check out my Craft Page for links to more fun and easy ideas for pet themed crafts for you and your pets. If you are a lover of all things pet consider following my blog via email; I post 1-2X per week on all things pet (craft ideas, dog training, pet rescue and more) and I post daily on my Facebook Page. I leave you with a picture of one of our foster dogs…Buster…he is just lovin’ this whole holiday/family thing…my folks came for an early Christmas in Kentucky…Buster got presents and loved hanging out with his foster grammy and grampy! If you have never fostered a dog…I highly recommend it…it is an amazing thing to see a dog who lost his original family begin to relax and feel at home and loved again. 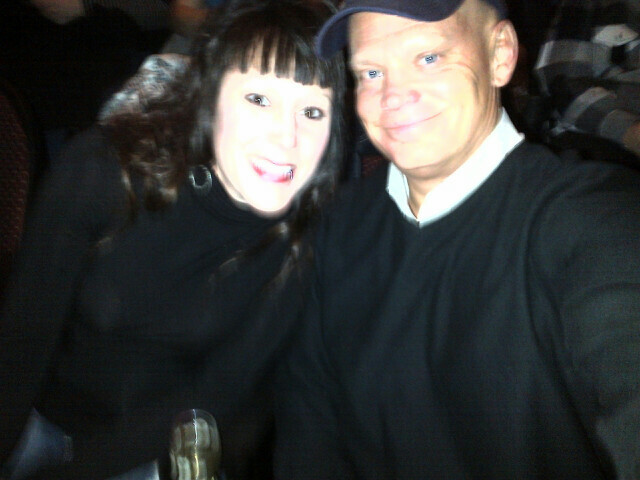 We love you Buster! I don’t know about you but by the time we get this close to the holiday season I am all done with the shopping and craziness …its time to nest and craft! Christmas crafts are my very favorite to make! 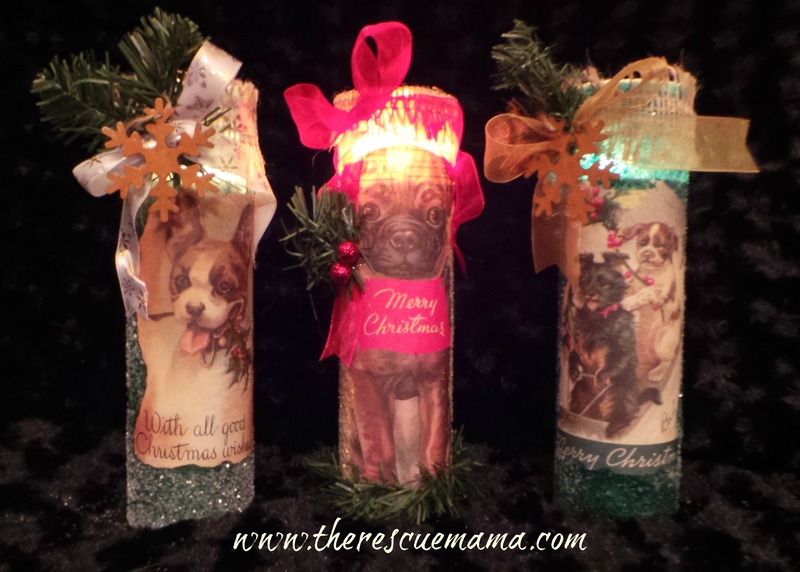 If you are looking for a quick holiday gift for your favorite dog lover these candles and jars are simple and inexpensive to make. I made several different versions using only a few supplies (listed below). Nothing about this project in itself takes very long, however, you do have to let layers of the project dry overnight for the best results. To light up the smaller finished candle holders I dropped in an inexpensive votive so the candle will be re-usable. I used three different items to make my projects. 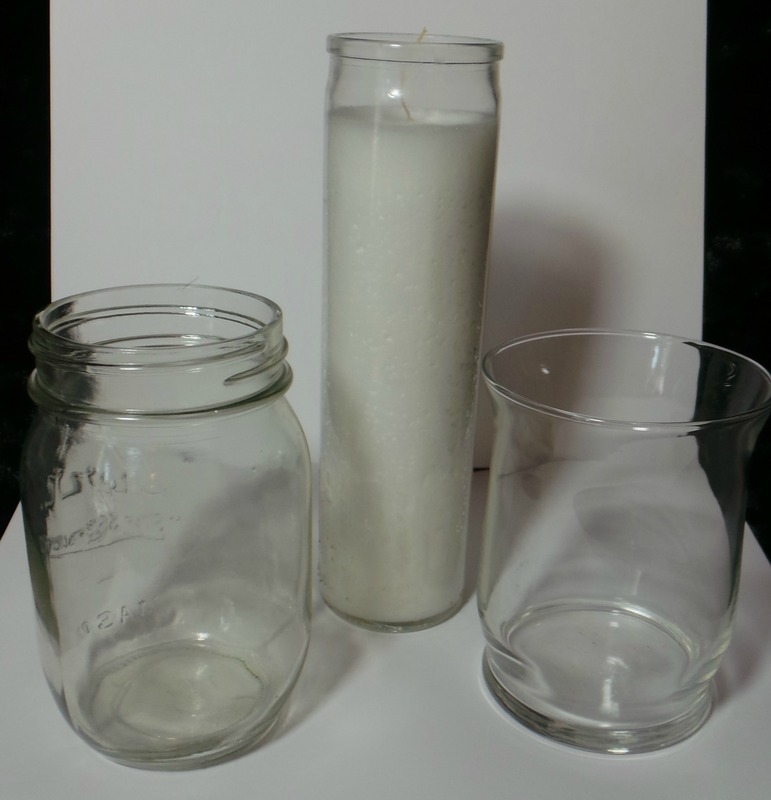 I used a canning jar to make a candy dish, a plain glass candle holder (purchased at the dollar store) and a tall votive candle (also purchased at the dollar store). 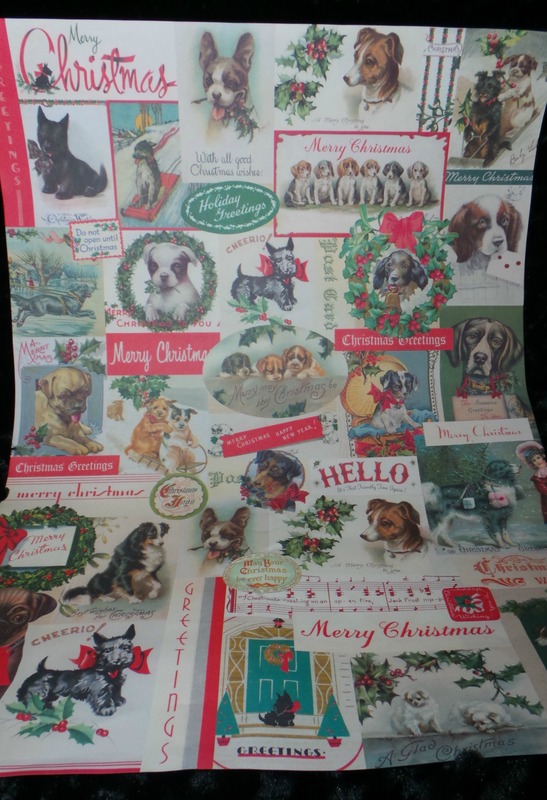 For my vintage dog pictures I used the Christmas Cavallini Dog paper that I ordered from the PaperSource for $3.95/sheet. You could use any pictures you want though and old greeting cards work great too. I like the Cavallini papers because they are a heavy duty paper that won’t tear when you are working on projects. The images also don’t run or fade. To get my project started I cut my images out from my Cavallini papers….for some candles I tore the images I have a rough edge on all sides of the image. I like to stain this images with Distress Ink to make them look older. I selected the tissue I was going to use with each candle and candle holder and cut it to the appropriate size for each project. It is better to make your tissue cut larger than smaller. 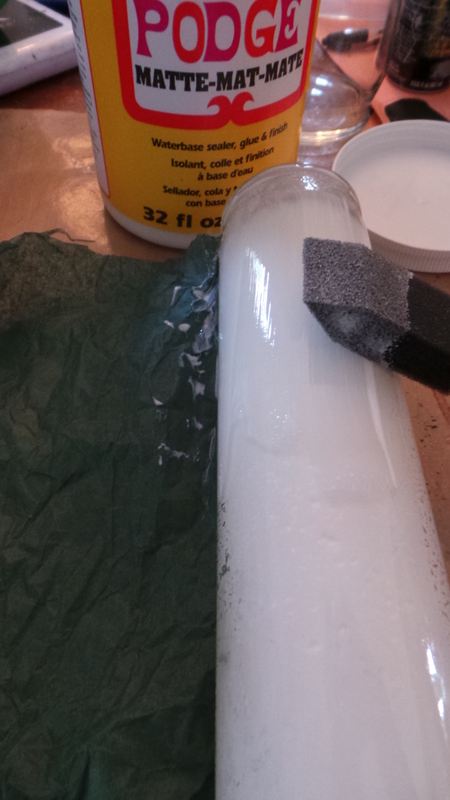 Coat your candle (or candle holder) with a fair amount of Mod Podge and literally roll your paper on to the candle. Don’t worry about wrinkles, they won’t show once we add the glitter…but do worry about tears…if the paper tears you will have light showing through and your finished project will looks sloppy…so work really carefully with your tissue. Once you are done let this dry overnight (you can let it dry for a shorter period of time…my general rule with mod podge though is to let layers dry overnight so I don’t end up with a tacky finished product). 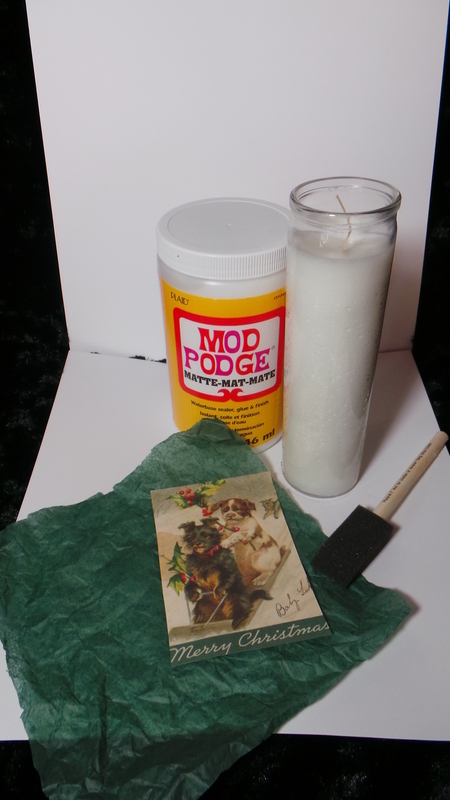 Put a layer (generous) of mod podge on the back of your chosen picture and place it on the candle or candle holder. Smooth out any puckers or wrinkles. Because you are placing it on a round surface you will get some wrinkling. Put a light layer of mod podge over the front of your image and let it dry overnight. 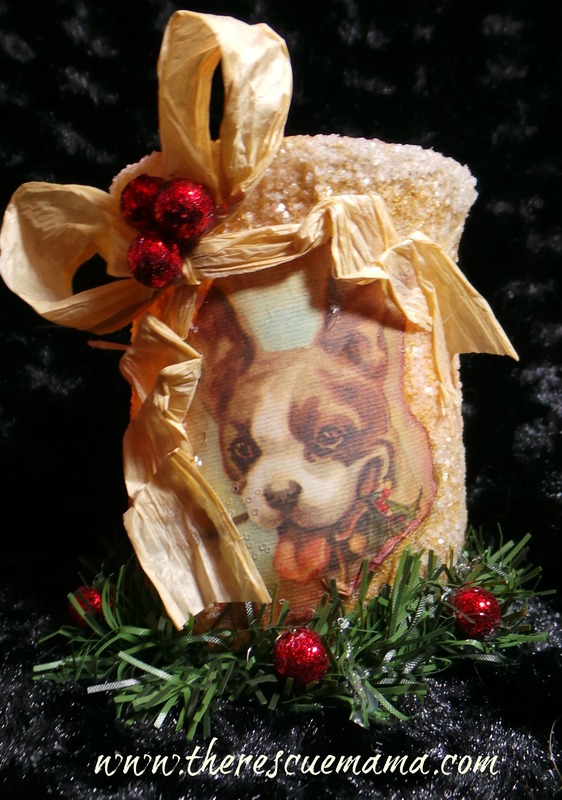 Cover the entire candle – EXCEPT the image – with a light layer of mod podge…sprinkle with glitter and let dry overnight. If you want a finsihed project that does not shed glitter than go back over the dry project with another layer of Mod Podge (dab with a sponge brush). You will lose some sparkle but have considerably less mess. Let dry overnight. 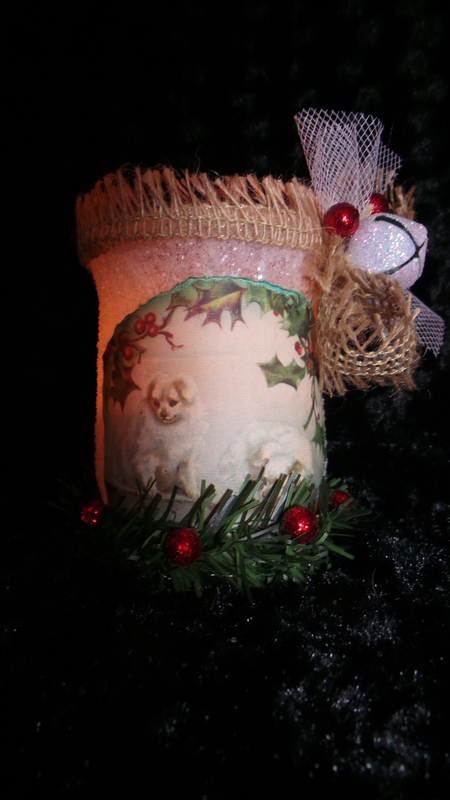 I embellished each candle with items I had in craft stash…ribbon, greens, ornaments, bells, etc. 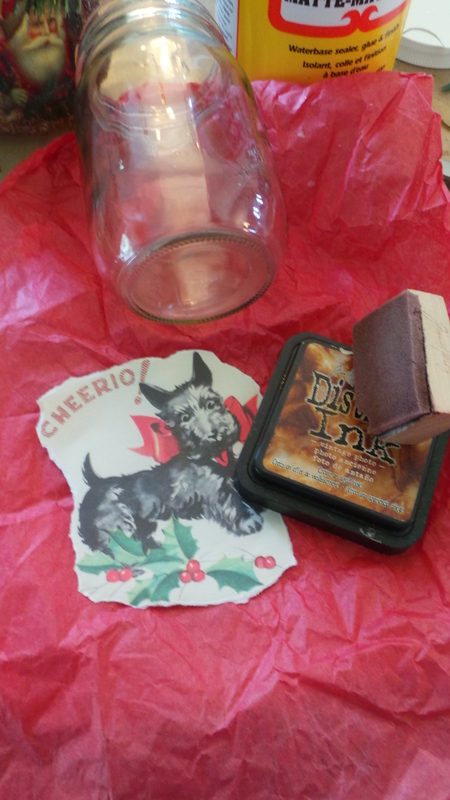 For the candy jar: I used a mason jar and red tissue paper. The tissue paper can be wrinkled and when you apply it to the jar there is no need to smooth out any wrinkles as the glitter will hide the wrinkles. You do want to be sure there are no tears though. If you have a tear in the tissue paper light will show through and your finished project will look sloppy. I tore out the image I wanted to use as the focal point of my jar. I used vintage photo distress ink to age the paper. 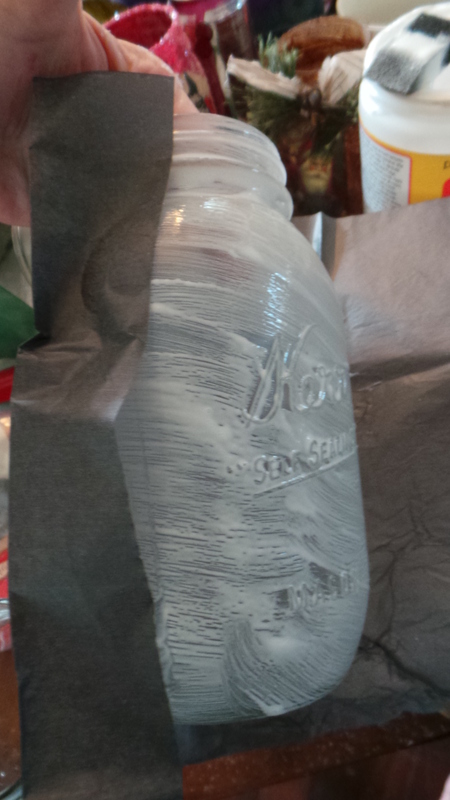 I did not want light shining through the jar so I added some paint to the Mod Podge before I applied it to the vase. The steps to get the paper on the jar are 1) cut your paper in a strip that will wrap all the way around your jar. 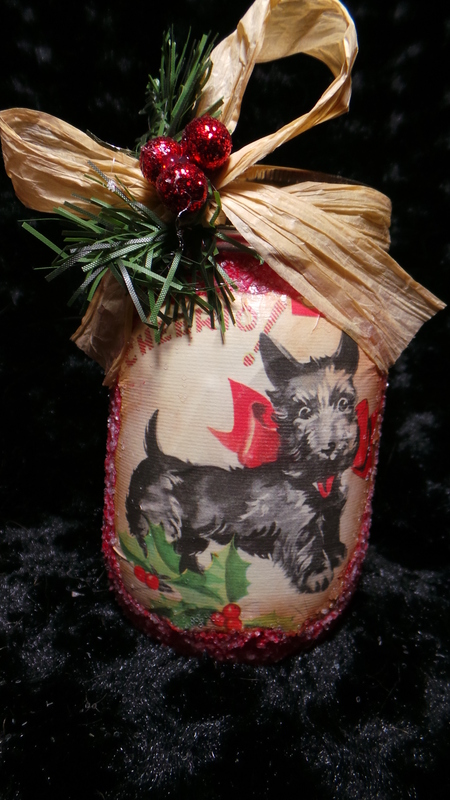 2) Coat your jar with mod podge (not too much or your going to have a mess, too little and your paper will tear). 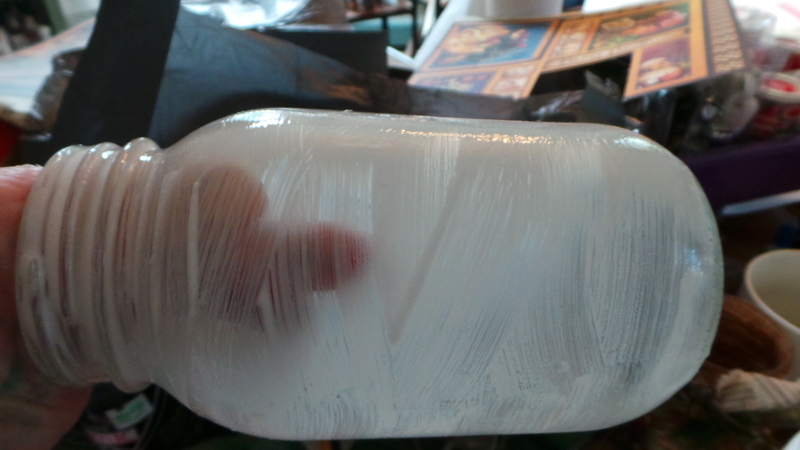 3) Wrap your paper around the wet jar and cut off any excess paper. 4) Let the project dry (I usually let this dry overnight). 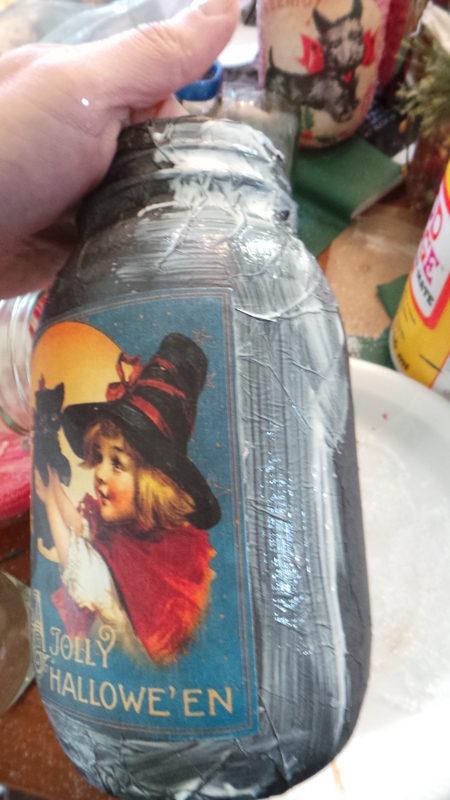 5) Coat the back of your vintage image with mod podge (generously) and place smoothly on your jar- do not put paint in your mod podge for this step. Once it is securely placed where you want it put a light coat of mod podge over image. Let dry overnight. 6) Coat your jar (with the exception of your image) with a layer of mod podge (no paint) and then sprinkle with glitter, let dry overnight. 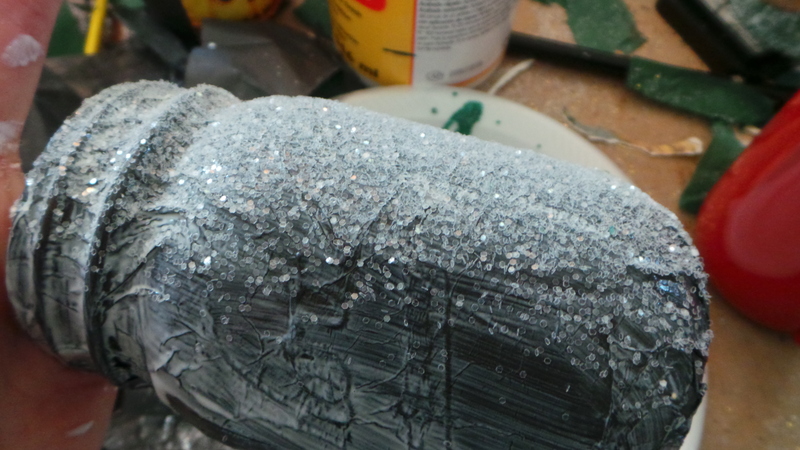 Optional step: If you don’t want any glitter flaking off your project re-coat the glitter with a light layer of mod podge (use a sponge brush and lightly dab). You will lose a little of the sparkle but in return will not have glitter flaking off the jar … which would be problematic if you are using it for a candy jar. 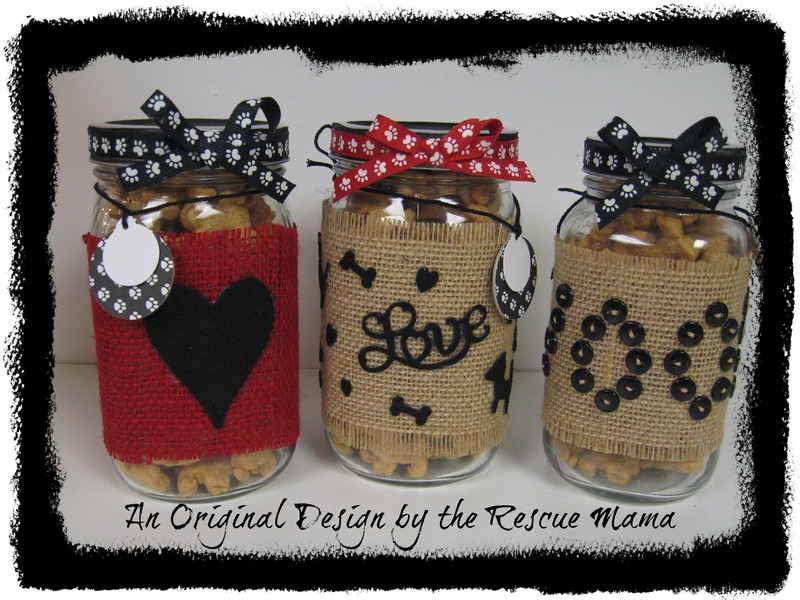 Here are some more photos of the finished jars…. Here are some other ideas for quick holiday gifts….there are free tutorials for all of these on my Craft Page! 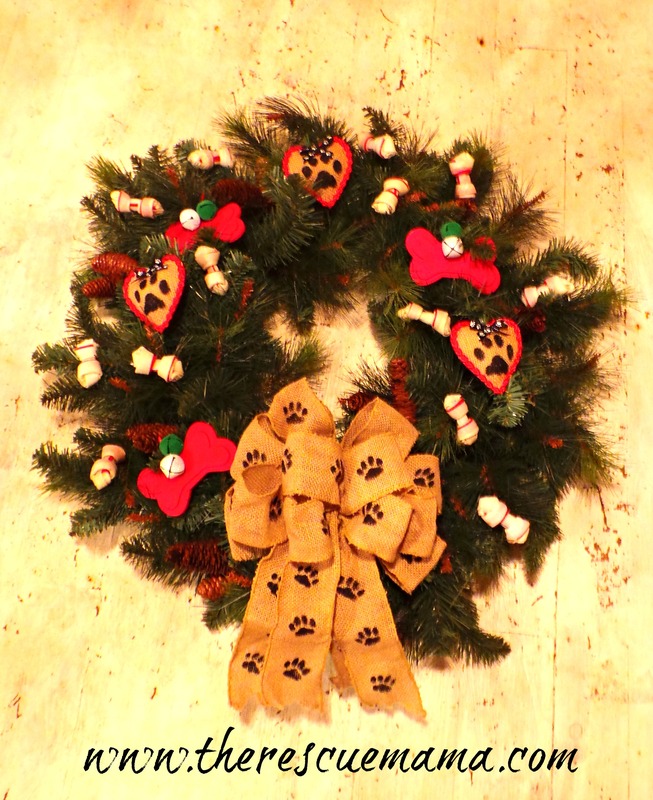 Paw Print Christmas Wreath for Pet Lovers! 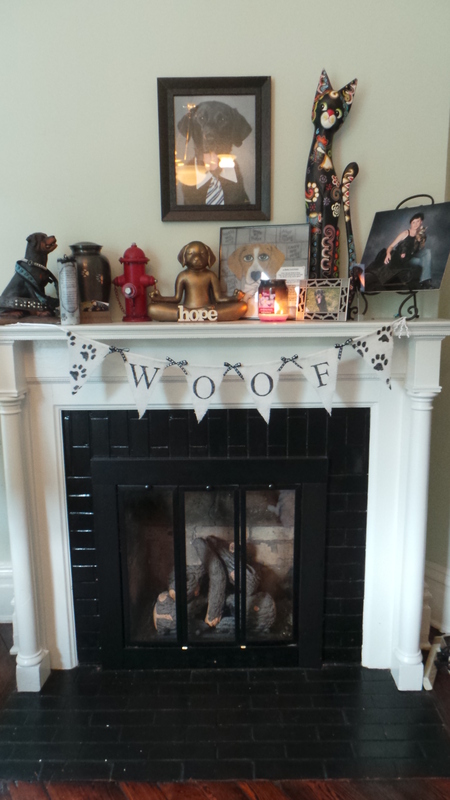 When we “deck the walls” at our house pretty much everything has a pet theme to it. 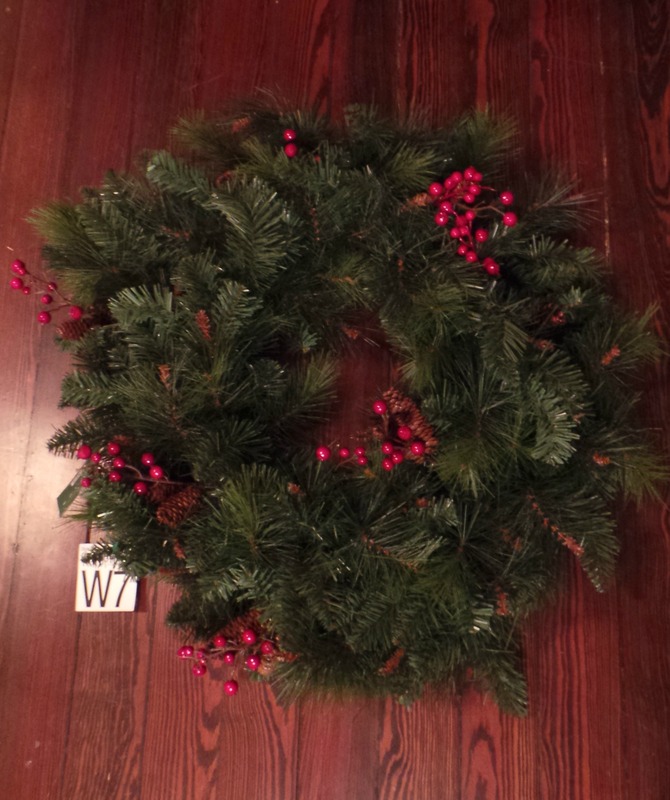 This wreath was super easy to make and fairly inexpensive as well. Most of the embellishments on the wreath were made from supplies I had in my craft stash. You could use just about anything for this, pet toys, chews, ribbons with paw prints, etc. I started with a plain wreath I purchased on sale at Hobby Lobby. I cut the red beads off of it but left the pine cones. I also purchased a plain burlap bow at Hobby Lobby (on sale). 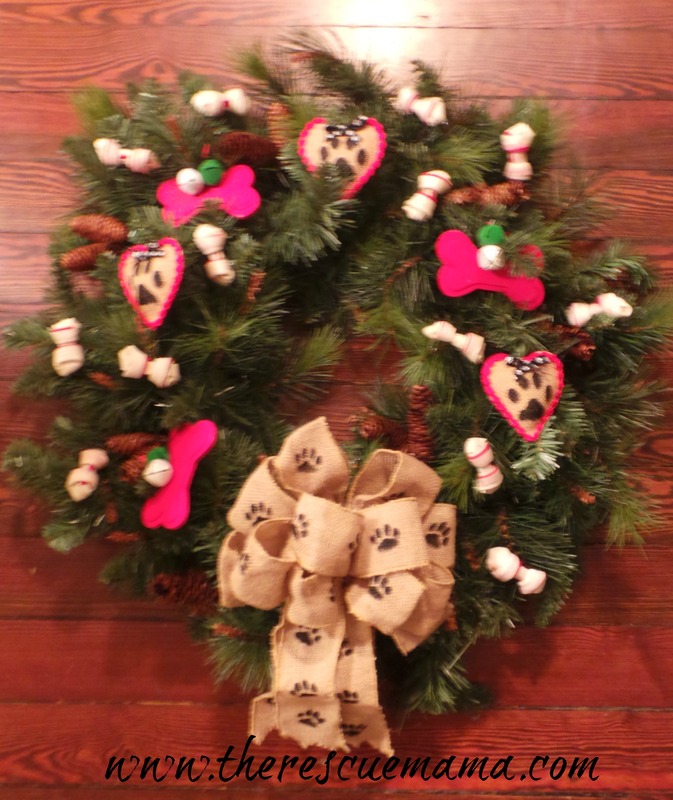 You could easily make your wreath bow out of any pet themed ribbon but I have been going with a lot of burlap crafts this year. 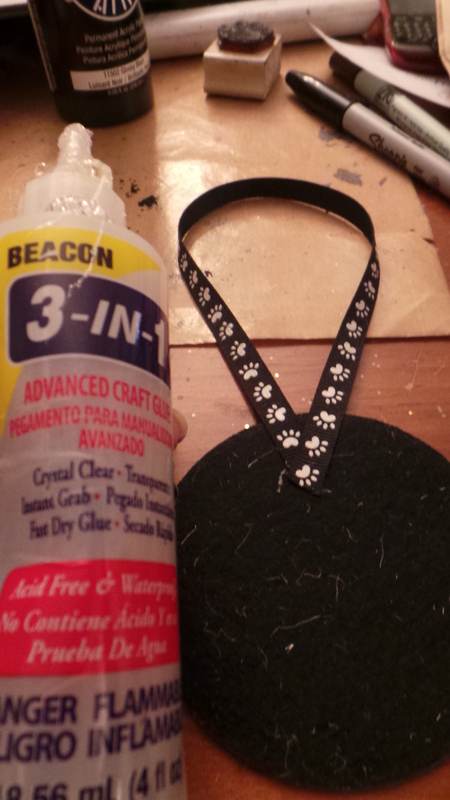 I used a paw print stamp, Archival Ink and black craft paint to decorate the bow. After it was dry I tied it on to the wreath. The red wooden bone ornaments were plain wood dog bones that I purchased at JoAnne’s last year after Christmas on sale. I painted them red with craft paint and tied large jingle bells to them. I looked at the JoAnne’s website and I don’t yet see them on sale this year. 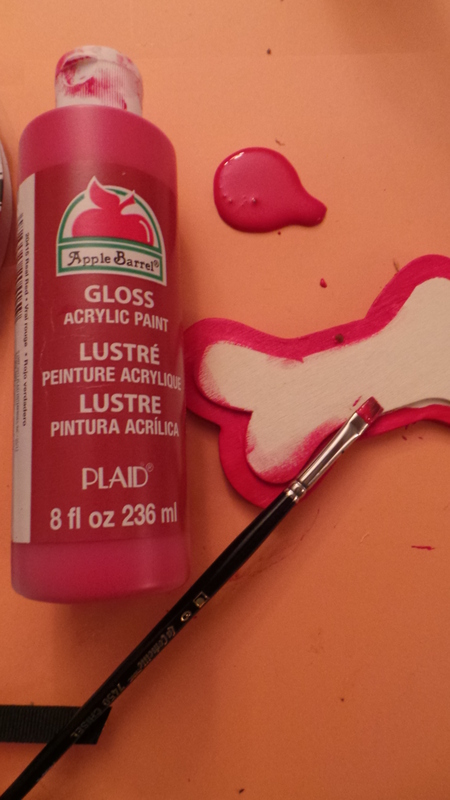 However, you could use a dog bone cookie cutter and trace them on to felt. There are also really cute glass dog bone ornaments at Hobby Lobby that would work well too. 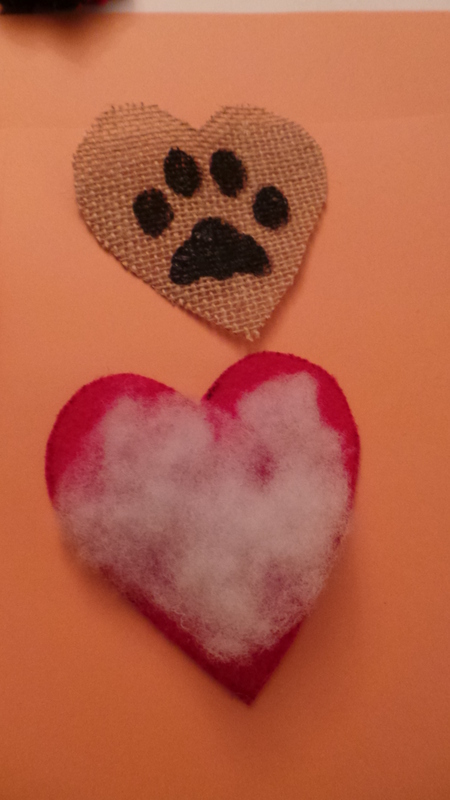 The paw print hearts I made from burlap and felt from my stash. 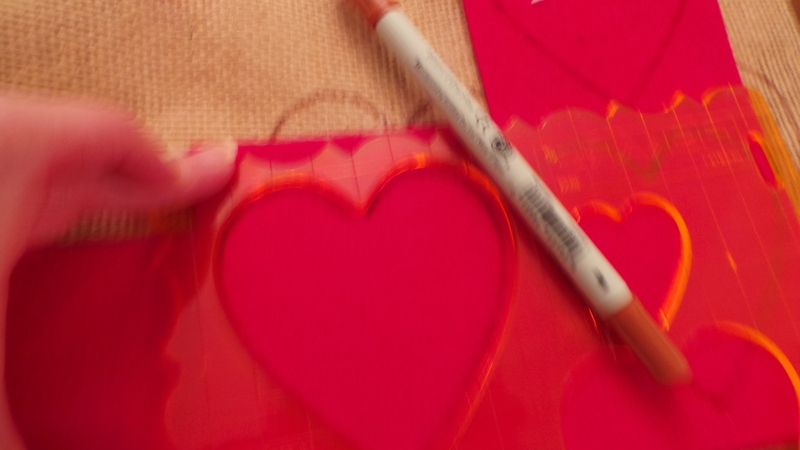 I used a heart heart shaped stencil to cut them out. 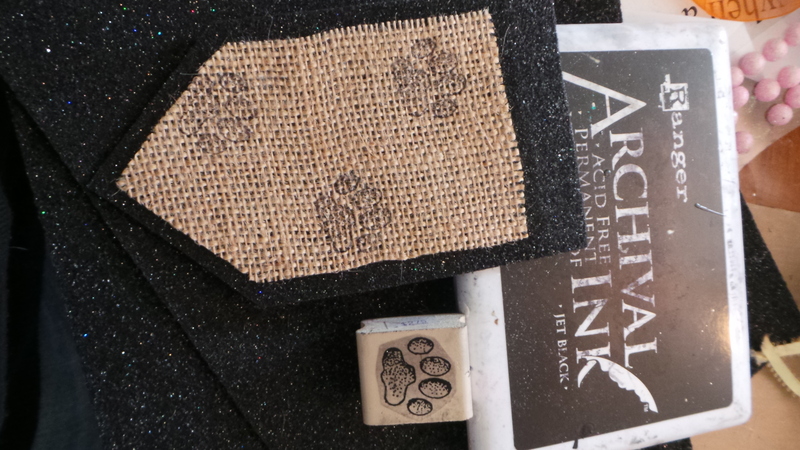 I used a stamp, Archival ink and black craft paint to put the paw print on the front of the heart. I filled them with a little stuffing and glued them shut with Beacons (felt on the back). 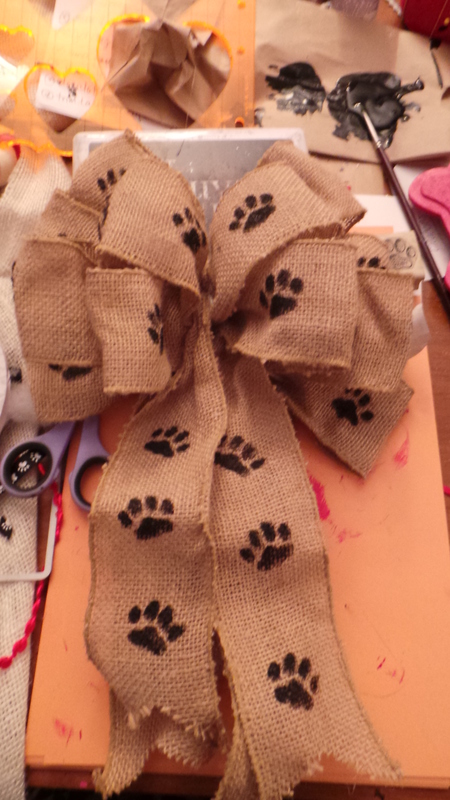 I added a bow made from paw print ribbon. I attached them to the wreath with thread. I finished the wreath off by gluing several small red and white raw hide dog bones around the wreath. I found these at Walmart for a few dollars (I do not feed these to my dogs). I hope you are having fun getting ready for the holidays this year! We moved this summer to a new house in Kentucky (from Minnesota) and while it is a super cool house (built in 1875) it is a bit of a project so we are decorating for the holidays around our remodeling projects. We are excited this year for the holidays in our new home…and thrilled that our pets are going to have a warmer winter to enjoy than what we used to have in Minnesota. We are grateful that our Sam is doing so well (he is our dog that had the stem cell procedure) and we are also grateful for the two foster dogs living in our home. We can’t wait to have a great holiday season with them. One of our foster dogs, Turnip (Jack Russell mix) lived a life of hell chained to a post for four years; sick, skinny and cold. This will be his first winter inside a warm home and we are THRILLED that he is spending it here. Our other foster dog, Buster (lab mix), was dumped by his family recently and is working hard to try to fit in here…we are thrilled to have him in our home. 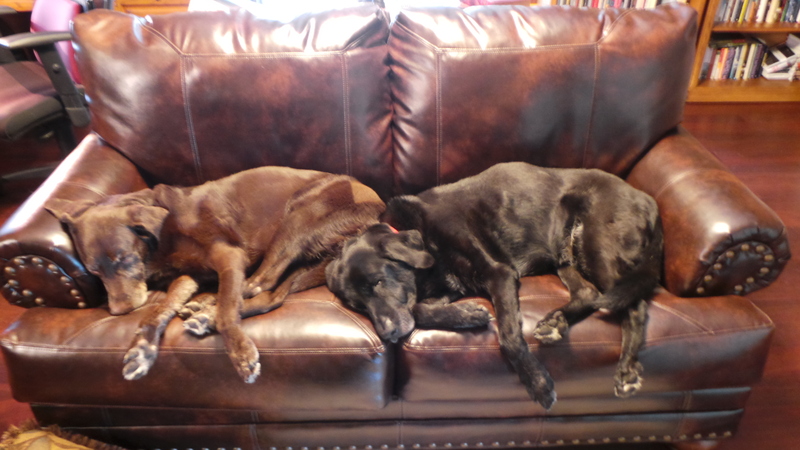 I firmly believe that some of life’s greatest blessings come wrapped in fur….Buster and Turnip are great blessings. 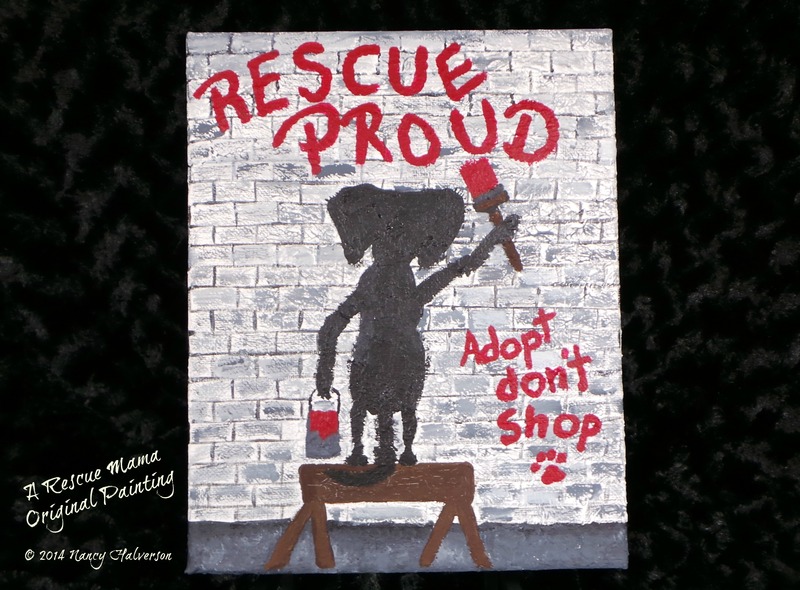 If you love all things pet and pet rescue sign up for my blog! 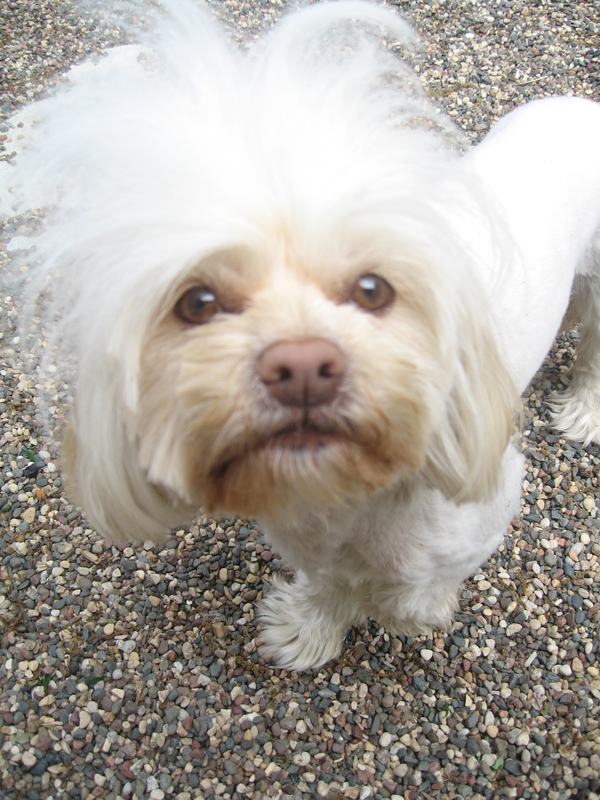 I blog weekly with pet crafts, dog training stories, rescue news and more. I post daily on my Facebook and Pinterest pages. Having trouble getting people to keep your gates closed in your yard? Our property at our new home in Kentucky is not a typical set up. When visitors, deliveries or service people come to our house they arrive at our back yard gate (our driveway winds to the back of our house). Our backyard is where are dogs go out to play so it is really important that our gates remain securely closed at all times. 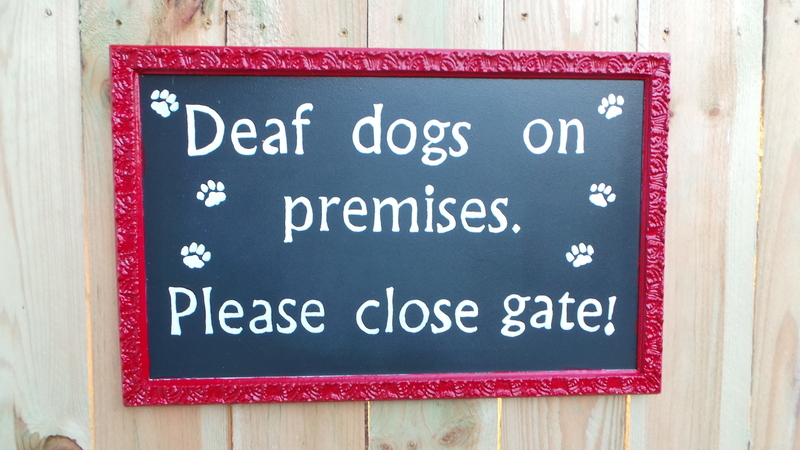 We have foster dogs at the house who don’t yet have a sense of where they are and two of our own dogs are deaf. If any of them were ever to wander from the yard it would be …well I don’t even want to think of what could happen. I decided I needed to make it as obvious as possible to visitors that it is important to always shut the gates to our yard. 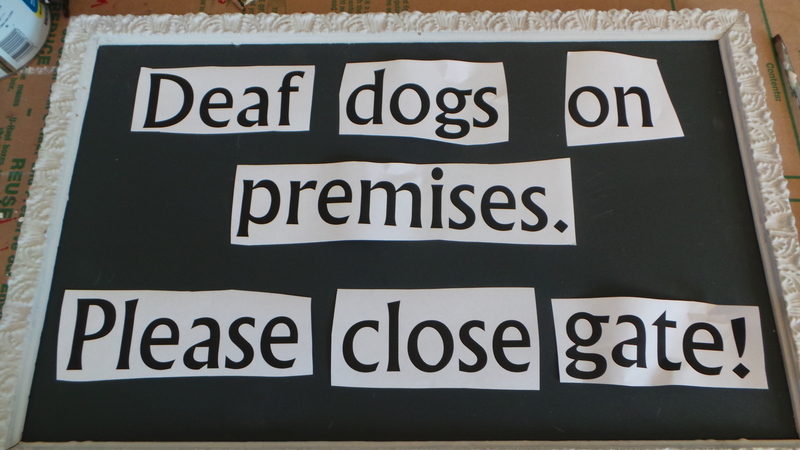 This sign is what I came up with… it is big enough and bright enough that I think it should do the trick and keep the dogs safe. It was super easy to make. I actually purchased the frame with a chalkboard base already in it at a flea market. It would be easy enough to do this on your own with wood and chalkboard paint. I repainted the frame with Valspar Latex paint. I printed the lettering out on my computer, cut it up and traced (with carbon paper) the letters on to the board. I painted the lettering white. I put several coats of polyurethane on the finished project. Below are pictures of my two dogs that are deaf…Sparky and Kringles…they are both 16 years old! 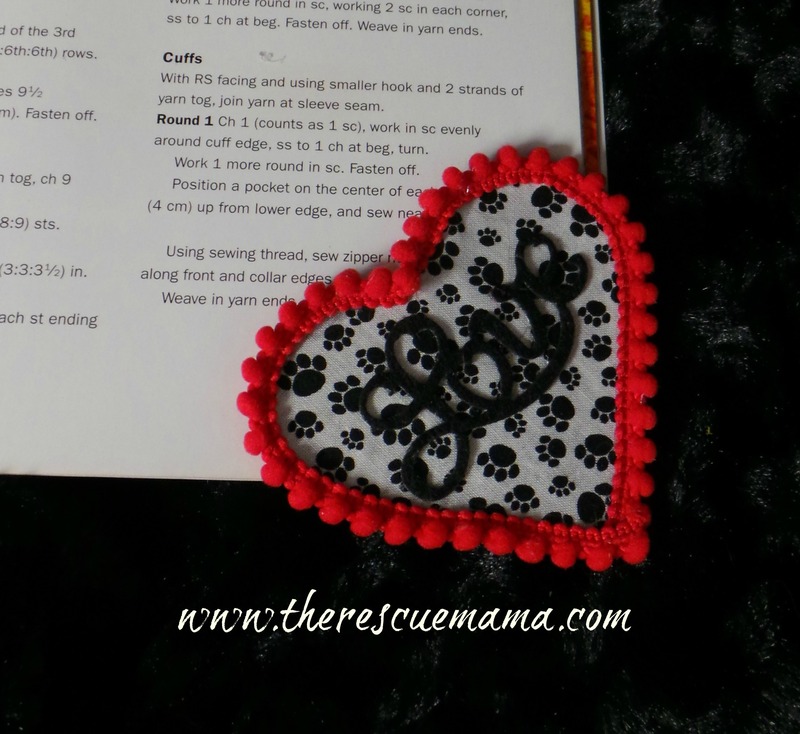 Enjoy making things for your pets and pet lovers….check out more of my craft tutorials on my Craft Page! 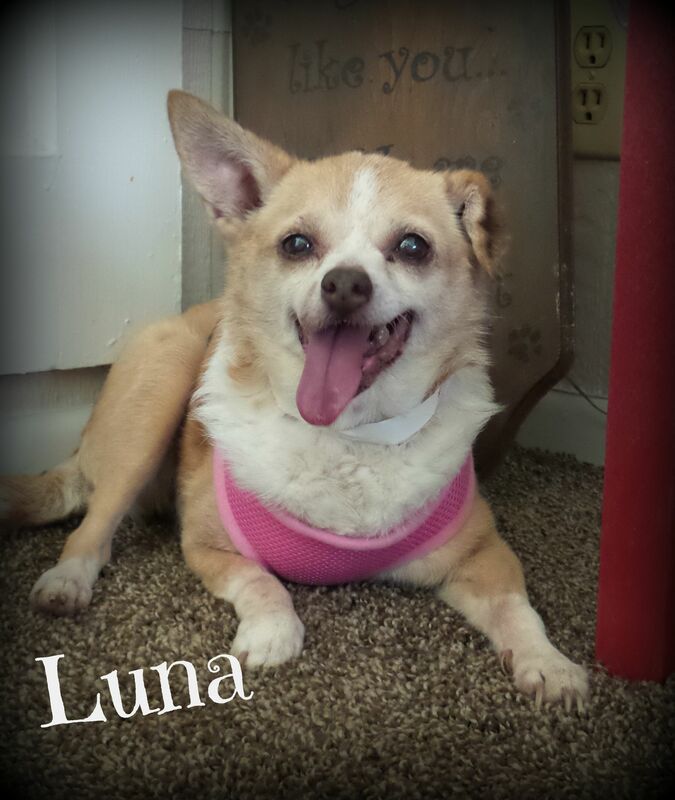 If you are a pet lover consider following my blog…or my Facebook or Pinterest Pages. In our house the Christmas season starts the day after Halloween and for us the season is an awesome time to focus on spoiling our pets. Christmas is a time to celebrate to all that good and joyful in creation and that most certainly includes the pets! I put up a pet themed Christmas tree every year. 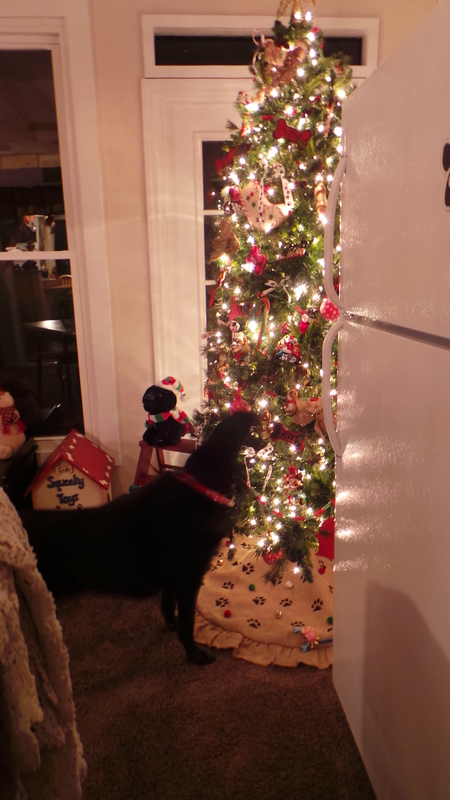 My pets love their Christmas tree because I hide treats in it throughout the holiday season. We moved from MN to KY this summer so I sold or donated many of my Christmas decorations before we moved (at 50 cents a pound to move things I figured it was time to cleanse and refresh some of my Christmas supplies). My pet themed Christmas tree come with us though and I decided it was time for a new skirt! I made this new skirt in one evening for less than $30. 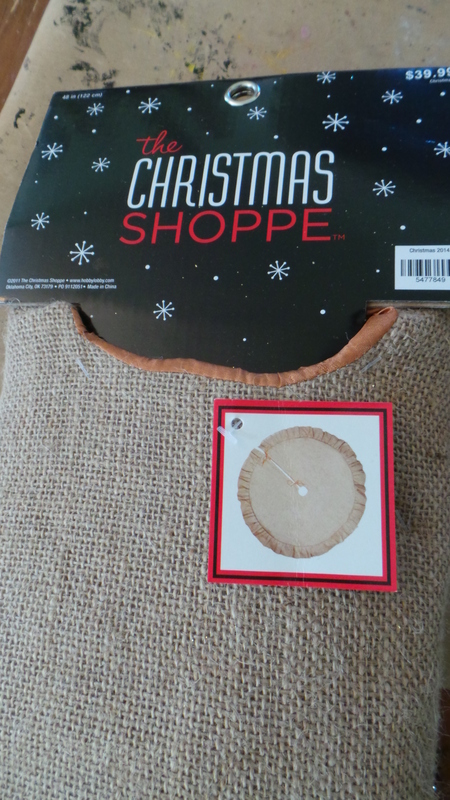 I started with a plain burlap pre-made tree skirt at Hobby Lobby for 50% off (net $20). 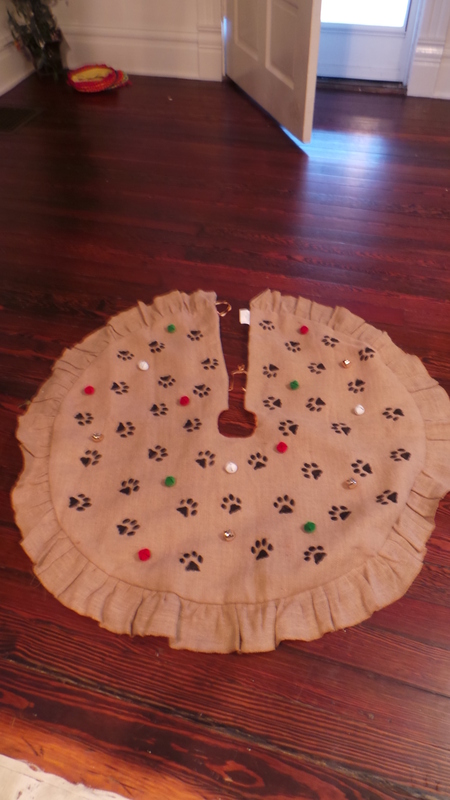 Usually I sew my own tree skirts but when I took in to consideration the cost of the burlap, the lining and my time to sew the project it just made sense to buy the skirt already finished. At $20 this was a great deal and time saver. This skirt is well made and has a tan silk lining on its backside. 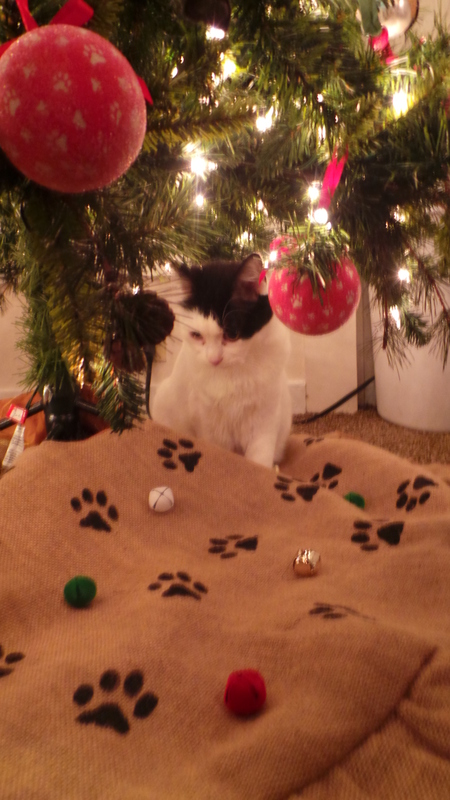 I ironed the tree skirt before I started working on it. 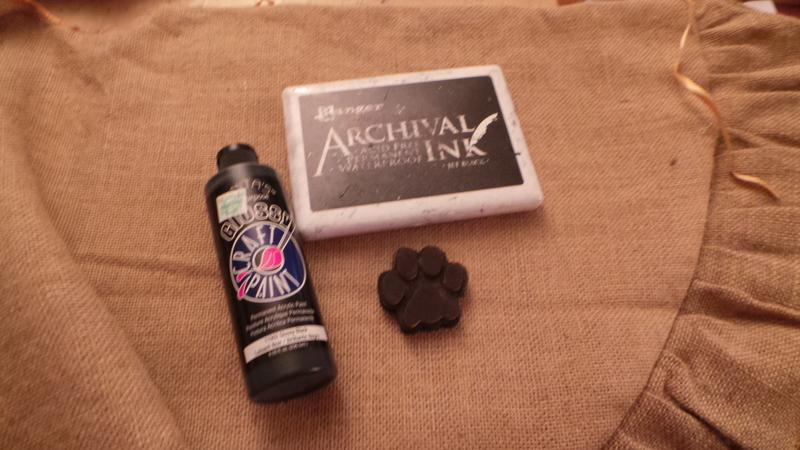 To get the paw prints on the skirt I used a paw print stamp, Archival Ink and glossy black craft paint. 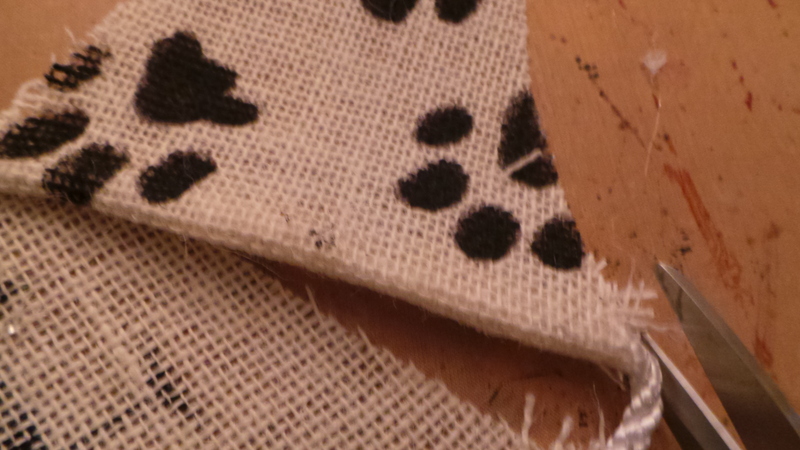 Simply stamping the paws prints on the fabric will not make a dark enough image for burlap. 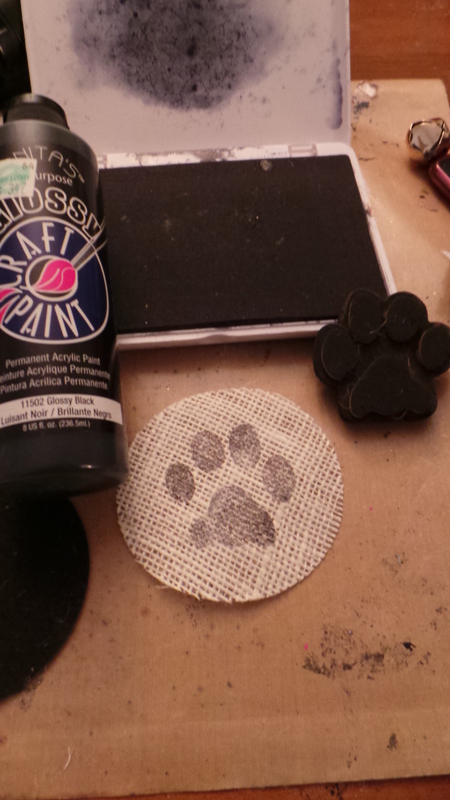 I stamped the paw prints first and then painted over them with the glossy black paint. Your are either going to have to do this in a workspace large enough to lay out your entire skirt or work on sections at a time and let the paint dry so you don’t smudge paint all over the skirt. I had some large jingle bells that I had purchased on clearance after Christmas last year so I sewed them randomly around the skirt. I used large bells in red, green, gold and white. You could use any size or color of bell or even sew on some holly, felt cut outs, pom poms or whatever Christmas craft items you have on hand. 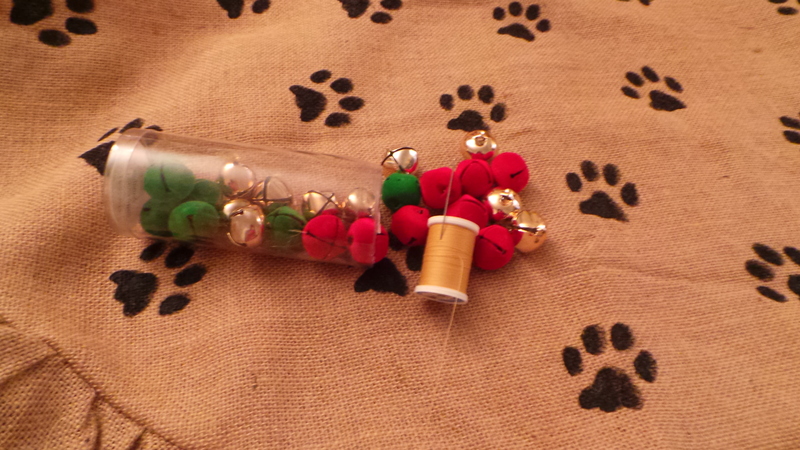 Because I have cats (who love all things that jingle) I sewed these bells on really tight. I completed the whole project in one evening (while watching the newest Good Witch movie on Hallmark :)). I just love the skirt and as it turns out apparently Taco loved it too…as soon as it was around the tree she was rolling around on it and playing with the jingle bells. I never tire of taking pics of my pets…but it is especially fun during the holiday season. I wasn’t kidding when I said my pets love their Christmas tree. Below is a picture of Sparky with his head shoved in tree looking for holiday treats within minutes of me finishing the tree! 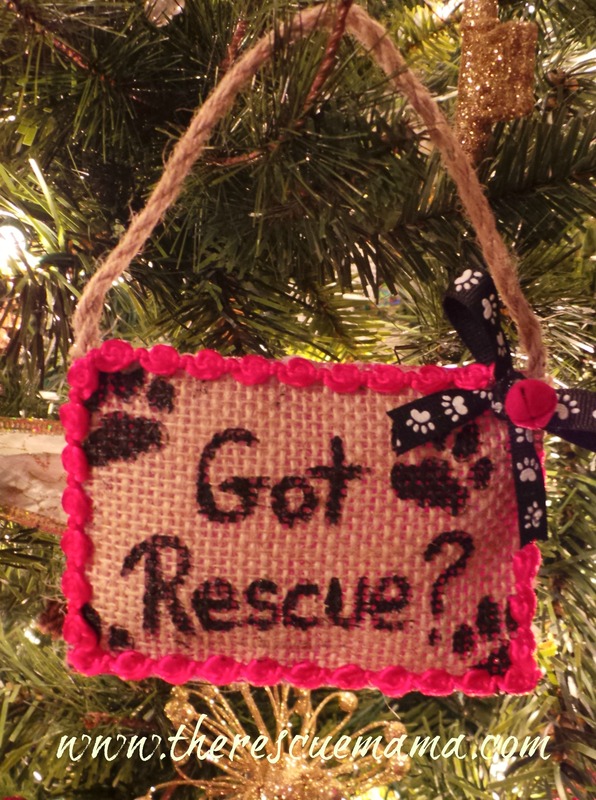 Looking for a fun pet craft for Christmas? I have a lot of fun making my dogs stylish gear for each holiday season. 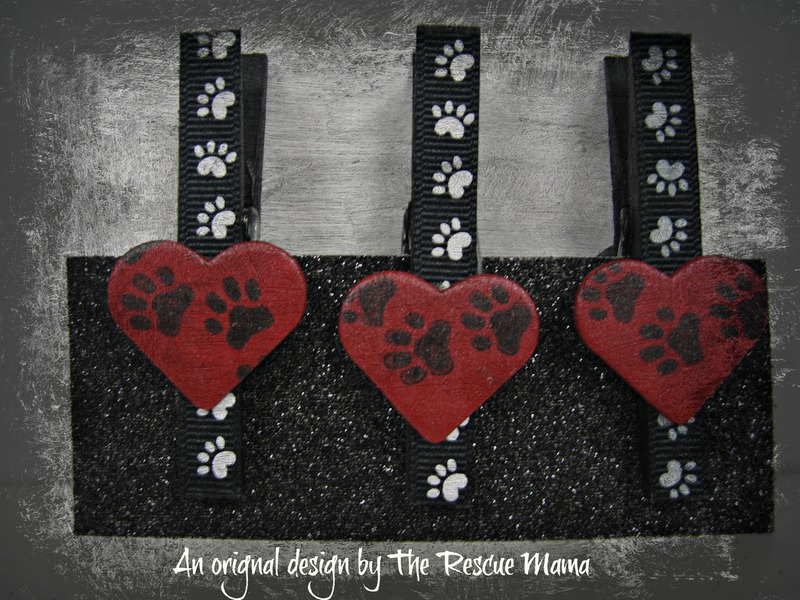 This leash design is my favorite for them for Christmas. 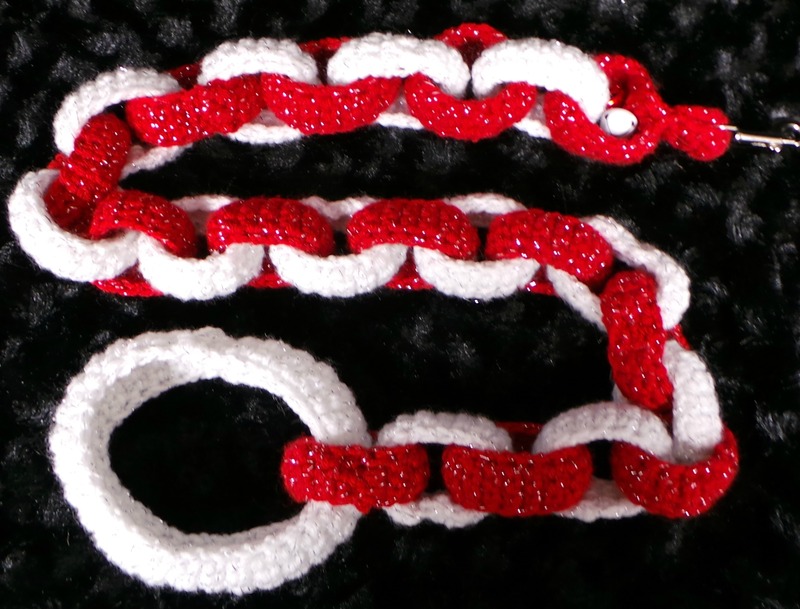 What could be more fun than Christmas garland loops and sparkly yarn? 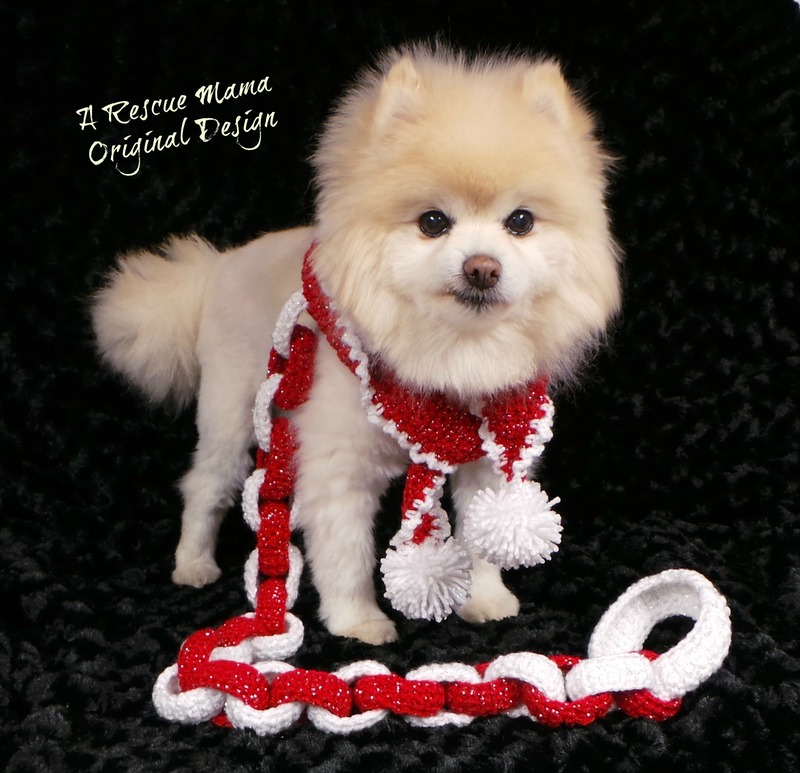 It is never too early to start on Christmas projects and shopping, Kringles was modeling this leash back in July! 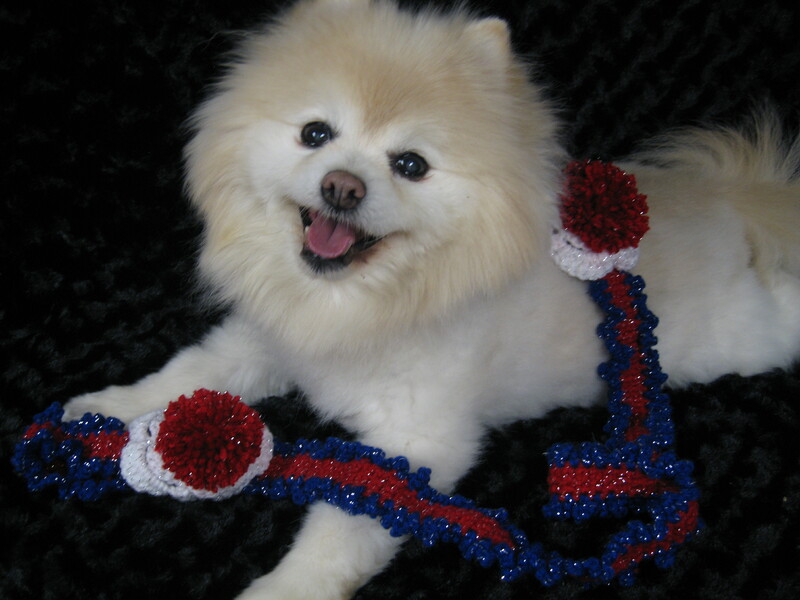 If you like to crochet here is a free step by step in a pdf file: Garland Leash Tutorial. 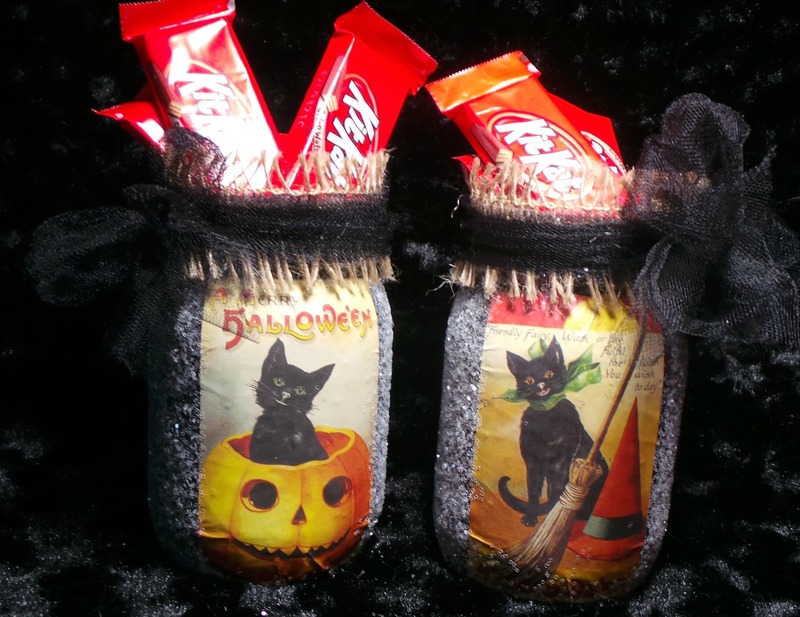 Check out my Craft Tutorial page for more ideas for great (and free) pet craft tutorials! If you don’t crochet for yourself I have a few of these leashes available for the holiday season at my ETSY shop. Use the coupon code “NEWCUSTOMER” for 10% of your first purchase. Are you a pet lover, animal rescue advocate or a crafter…follow my blog for fun pet news and articles and fun tutorials. I post to my blog 1-3 times per week and to my Facebook and Pinterest daily. I love fall and everything that comes with it…the pretty trees, Halloween candy, fall walks with the dogs and black cats! I have been doing a ton of dog walking and enjoying the cooler weather, the changing trees and the calm before the holiday storm. I made these fun jars to go on one of the seven fireplace mantles in our new home in Kentucky. This was a quick and easy project that cost me less than $10 to finish (excluding the candy in the jars). I found the black cat craft paper at Archivers (when it was still open). 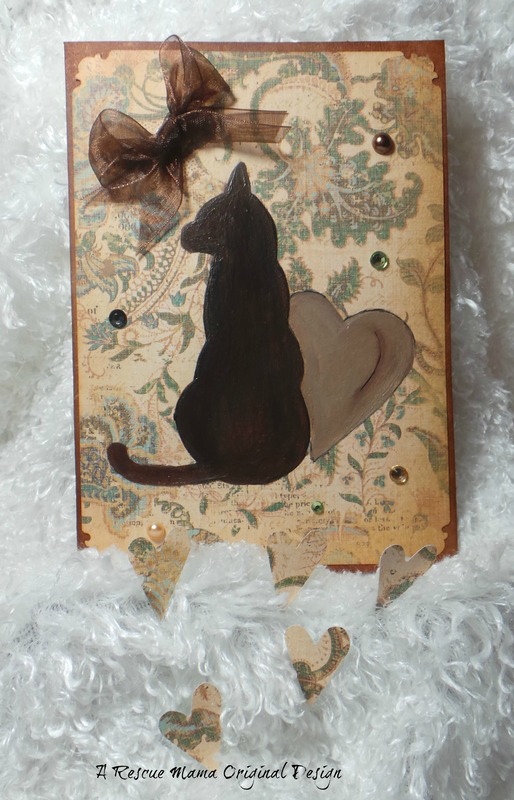 I just love these vintage looking cat pictures and the card stock is a weight that is perfect for craft projects. Unfortunately this particular paper is no longer available. 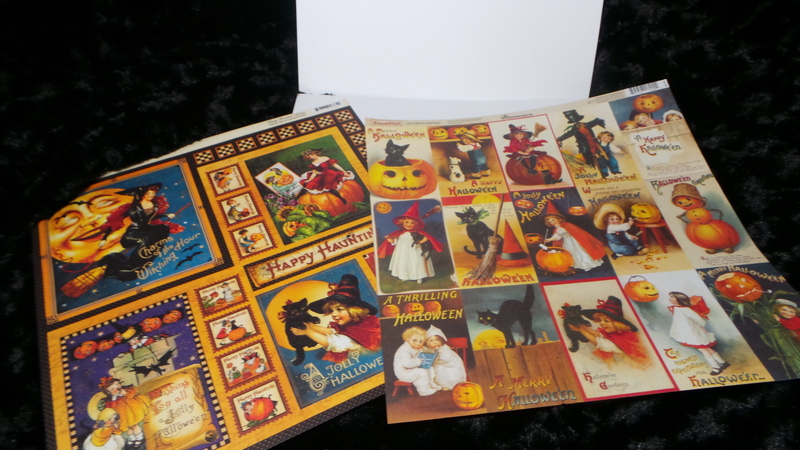 I did a quick search on ebay though and found a variety of black cat vintage card stock that would work just as well. 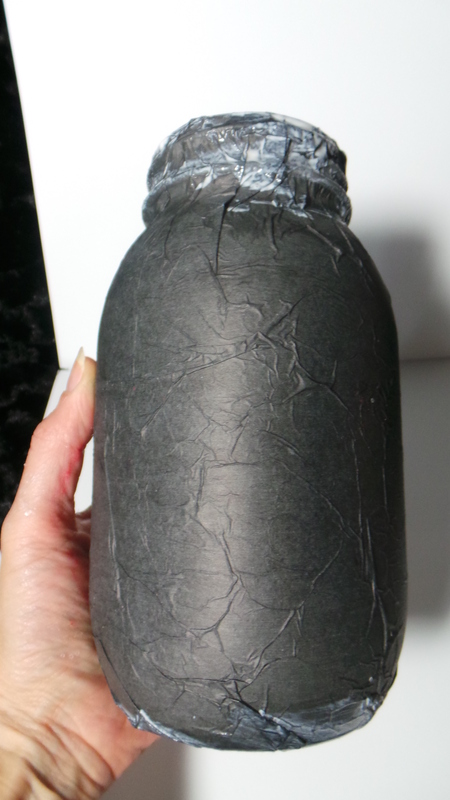 The first step is to cut a piece of black tissue paper roughly the size of your jar. It is easiest to set your jar on the paper and roll the paper around it. It is ok for the paper you cut to be bigger than the jar but not smaller. Using Mod Podge and your sponge brush completely cover your jar with Mod Podge. Don’t over do it with the Mod Podge or your paper will tear. 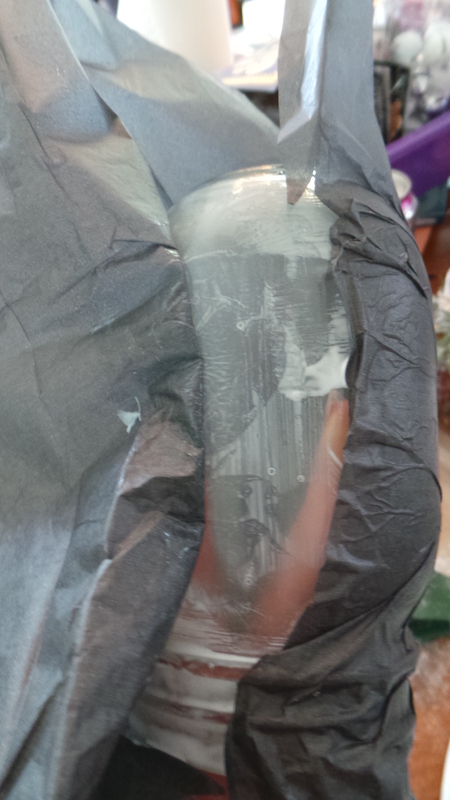 Wrap your tissue paper around your jar. Do this carefully so that your paper will not tear. It is ok for your paper to look wrinkled but a tear will make for a poor finished look. If you paper does tear try to position it back in place such that you can no longer see the tear. Don’t try to patch a tear. Let your jar dry (I would let it dry for a few hours). Add your vintage pictures by applying Mod Podge to the back of the picture and carefully smoothing it out. 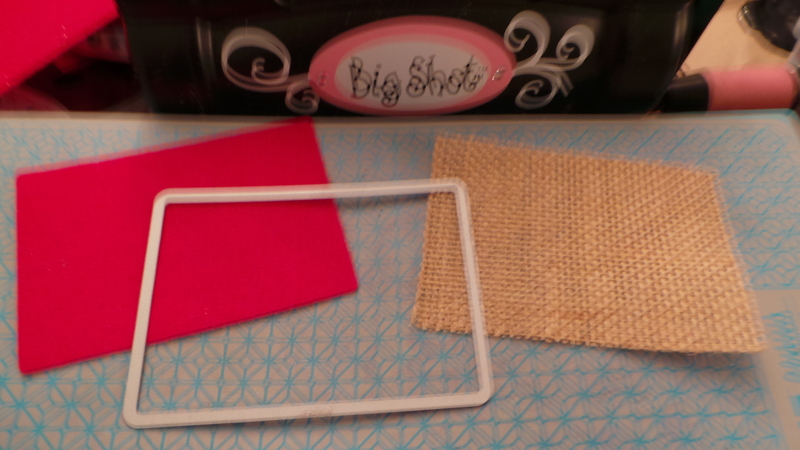 The heavier card stock will take some effort to smooth out when applying it to a rounded jar. 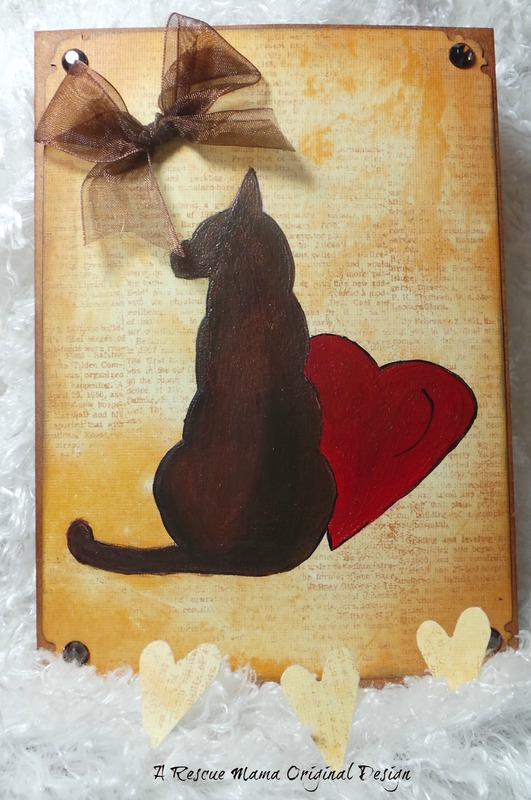 I would go over the front of your picture (once its positioned and smoothed out) with a light layer of Mod Podge. Let the project dry for at least a few hours. 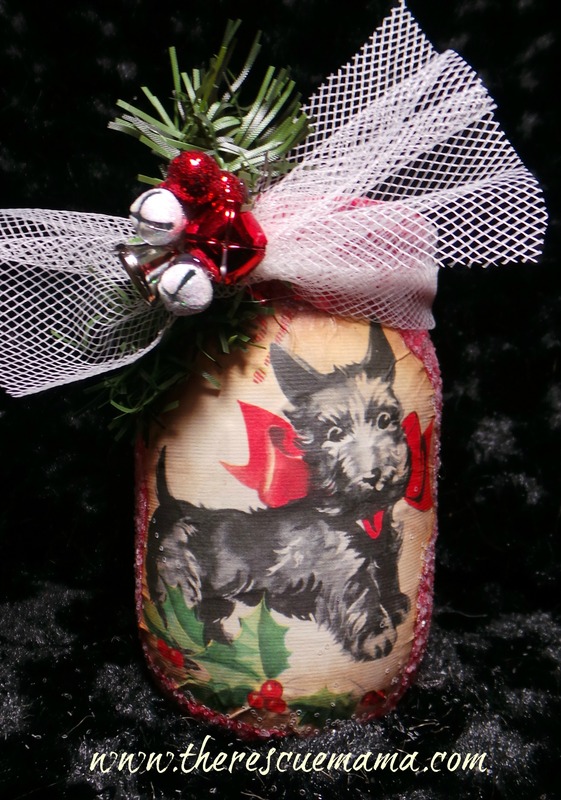 Finally go over your jar (with the exception of the vintage picture with another layer of Mod Podge. Hold your wet jar over a paper plate and sprinkle it with glitter. Set upside down and let dry for several hours. 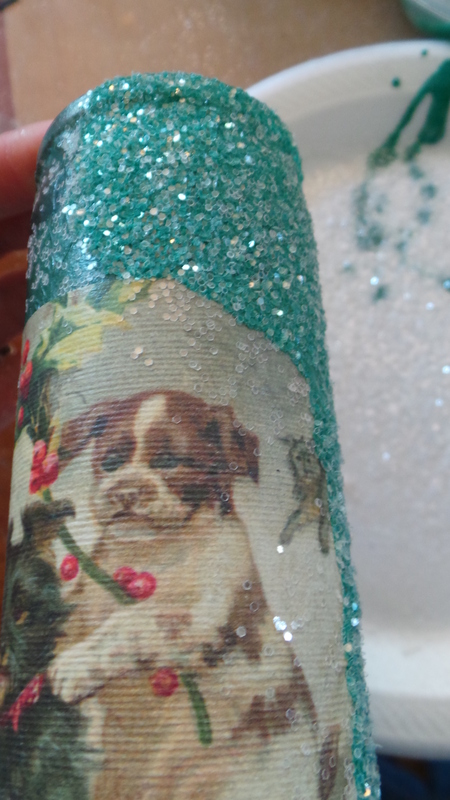 When your glittered jar is dry you can either leave it very sparkly (but you will always have some glitter flaking off) or you can go back over it with another layer of Mod Podge to secure your glitter but it will not be as sparkly. For this project, because it was going to remain in my home I left it sparkly. 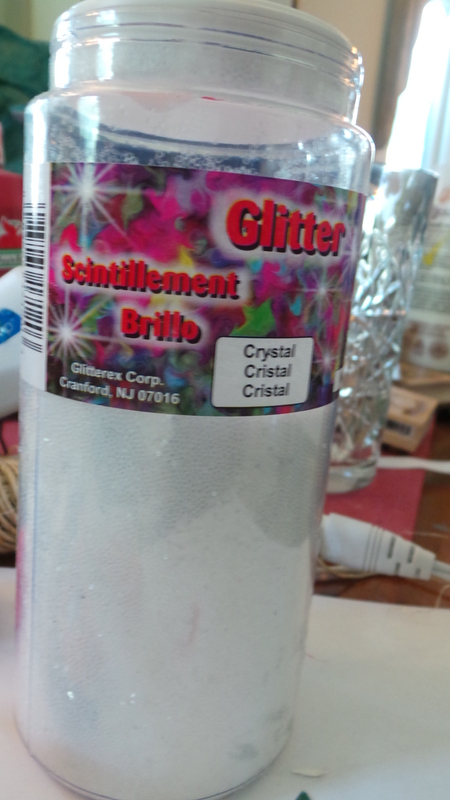 If I were giving it as a gift I would have gone over the glitter with Mod Podge so I wasn’t giving a messy gift. I embellished the rims of my jars with some burlap ribbon and black tule that were in my scrap baskets but you could use any kind of ribbon you wanted. 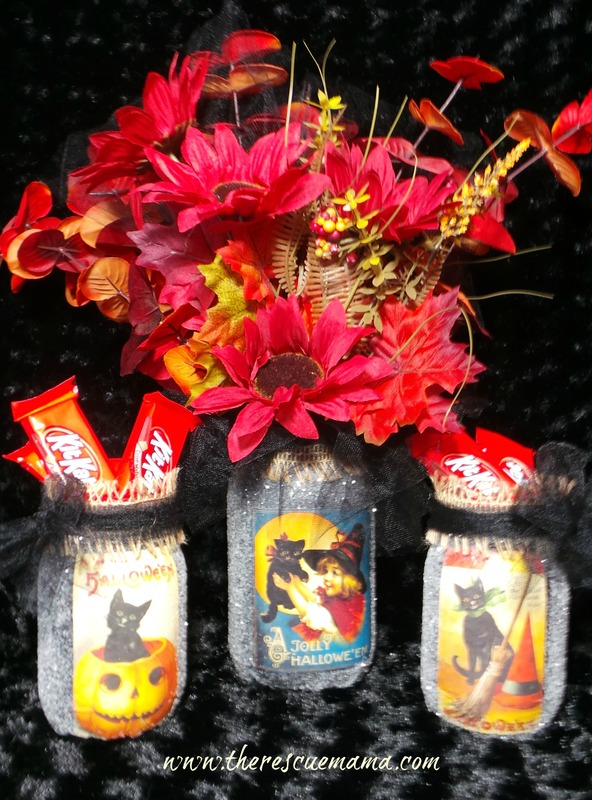 I filled my jars with candy and some flowers I had in my supplies. 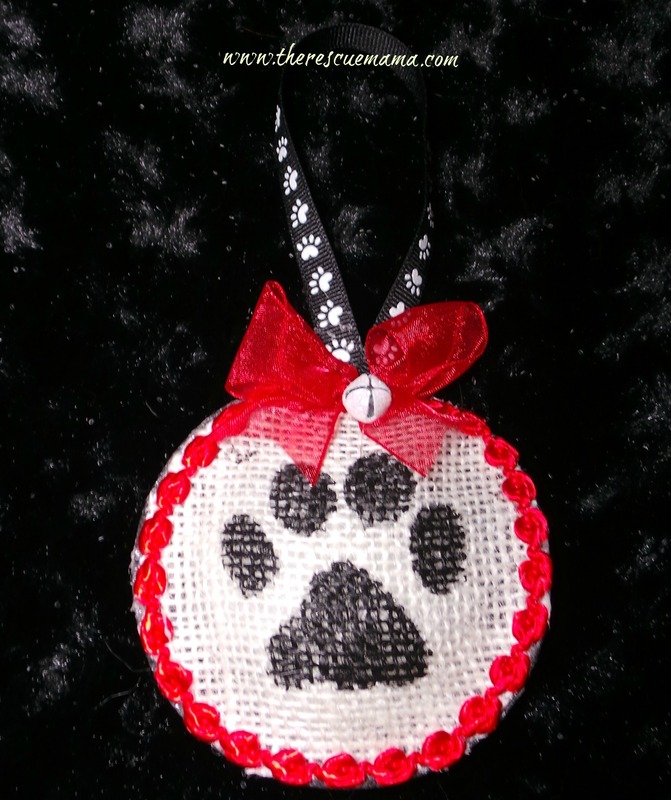 If you are looking for more Pet Crafts check out my Craft Page. Below is a picture of Turnip’s first bath. Turnip is our foster dog who is as sweet as he is cute. 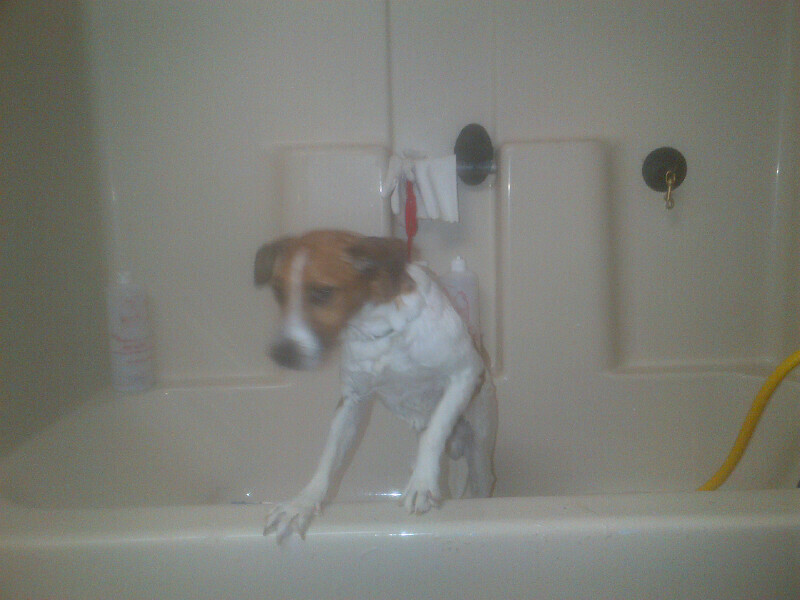 He is afraid of pretty much everything and this bath was not his idea of a good time but he was a trooper. 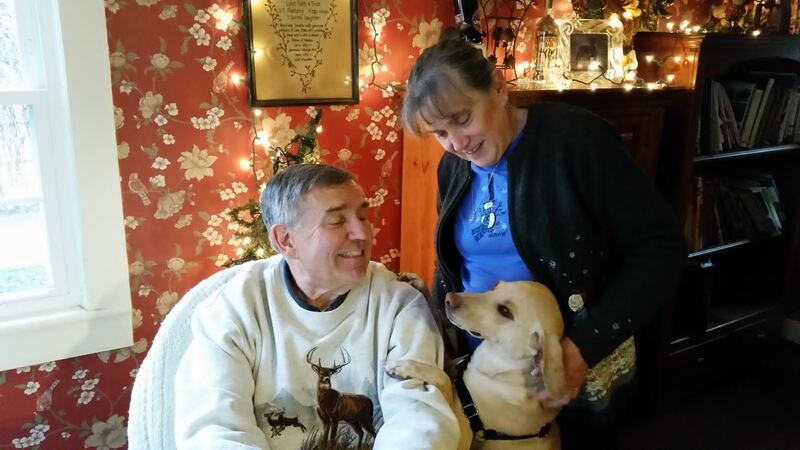 Turnip continues to adjust to life in a comfy home with a big family. He has been working on his leash manners (he is doing great) and is growing more comfortable with us everyday. He continues to get more rambunctious each day too which can only mean his Hyptoplasmosis is continuing to heal. This week he has finally started to bark! Turnip was rescued from his chain of horror in January…no one has heard him bark since he was rescued. 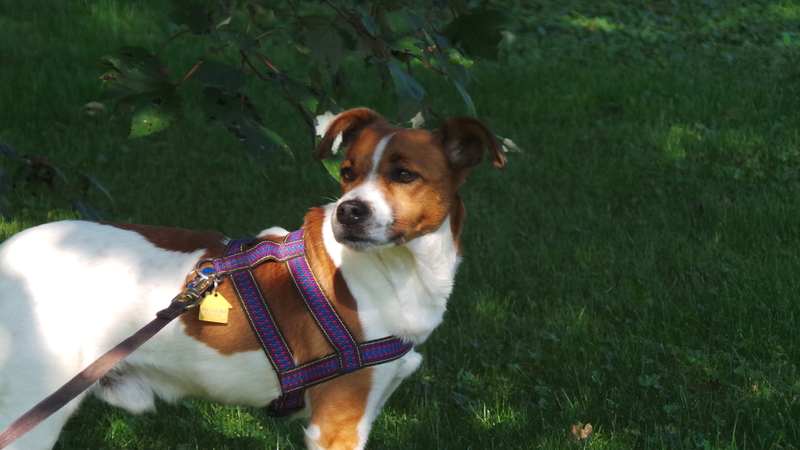 This week he barked and howled in the backyard a couple of times…we clapped and cheered for him. There really isn’t anything more lovely than watching this dog heal socially and emotionally from the years of abuse and neglect. Taking care of our first foster has been a great experience. He is reminding us how important the simple things in life are…like the taking the time to appreciate the loved one’s around us who make life so good. For more about Turnip’s story read his first post. Do you like all things pet? 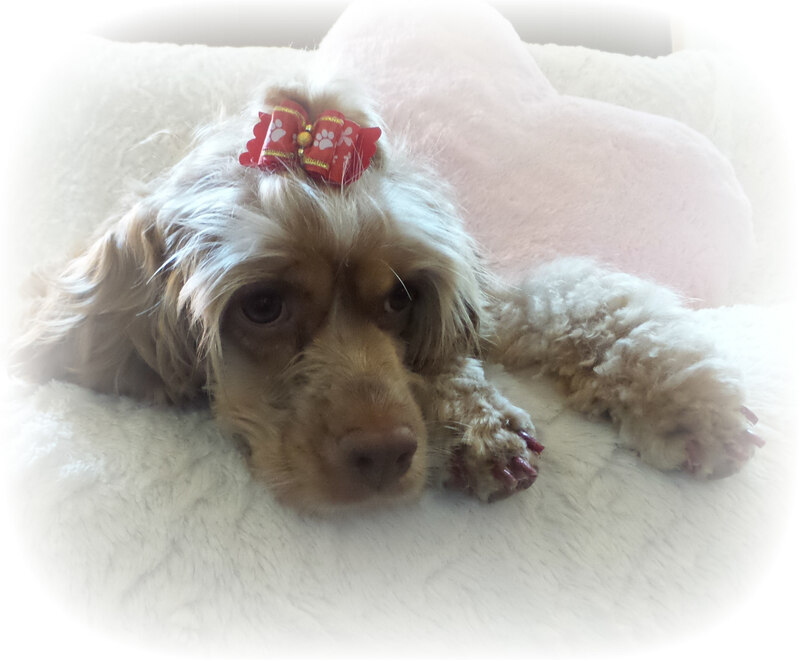 I blog weekly about pet rescue, pet crafts and pretty much all things pet. Consider following my blog (subscriber box in the right margin) and/or follow my Facebook and Pinterest pages. 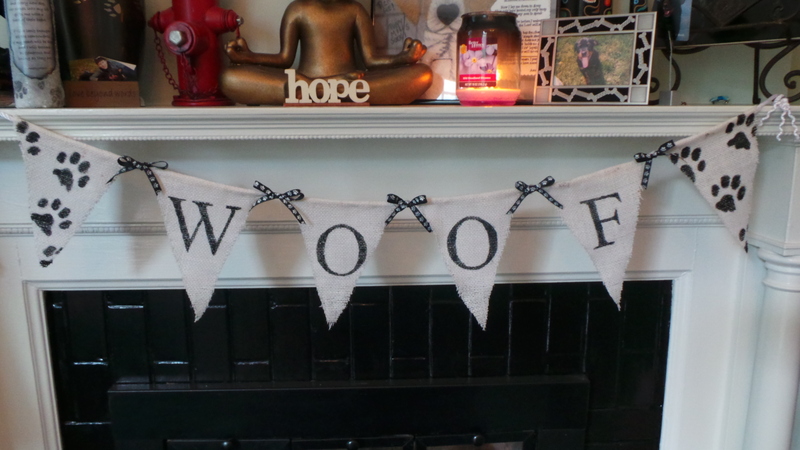 I made my white WOOF banner first. The first step is make a pattern shape for your banner. I make my patterns on my computer (in powerpoint), cut them out and pin them to my banner fabric and cut each one. Here is a pdf file of the template for this banner : WOOF Banner. 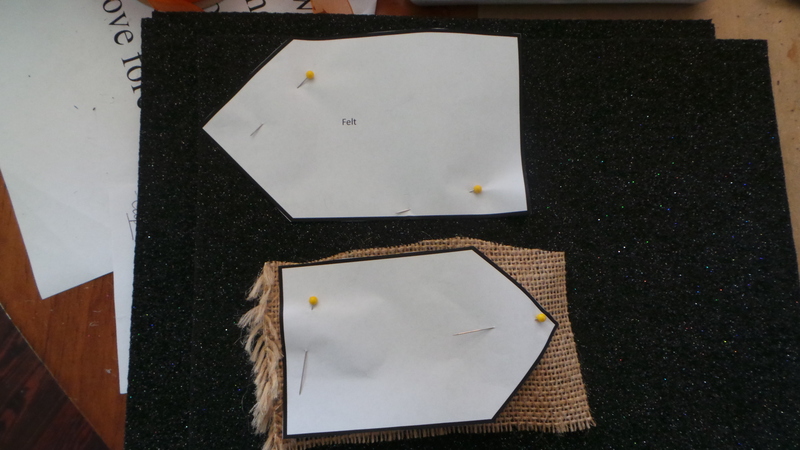 Particularly when you are cutting burlap you are going to want to pin your pattern securely to the burlap. 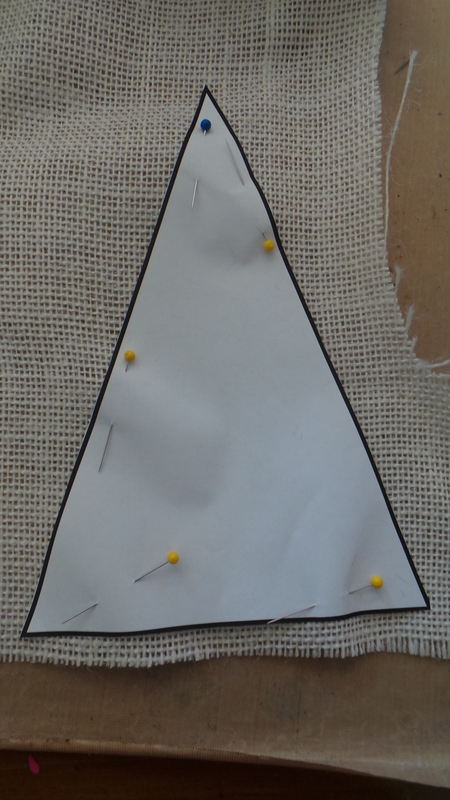 Line the top edge of the pattern up with a strand of the burlap when you pin. Once you cut your burlap piece, iron it and be gentle with it as you work so it will not fray (we will address stopping the fray shortly). To create my letter stencils I printed out WOOF in the size and font I wanted in Microsoft Word and carefully cut out my letters. When I put the stencils down I tape them in place, and use a flat brush or sponge to dab the paint on (I use a minimal amount of paint and dab lightly). Let the stencil sit for a few minutes to dry. 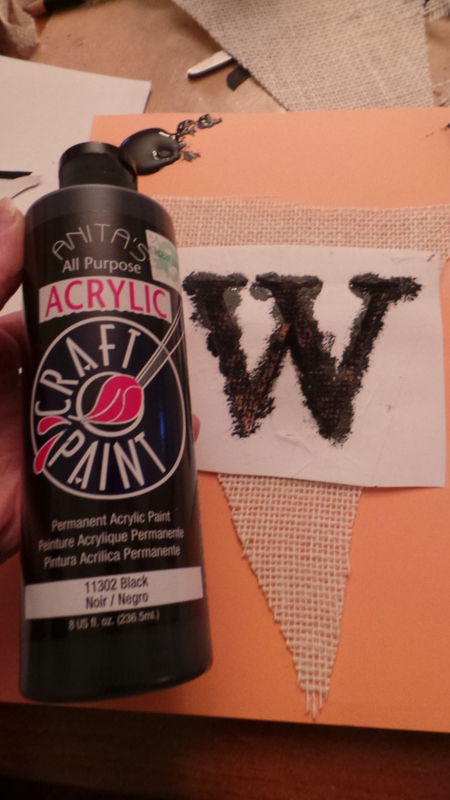 After I pull the stencil off I touch up the letter with a pointed brush to make it a darker and cleaner paint job. If you use too much paint or press to hard with the initial stenciling you risk bleeding under the stencil. 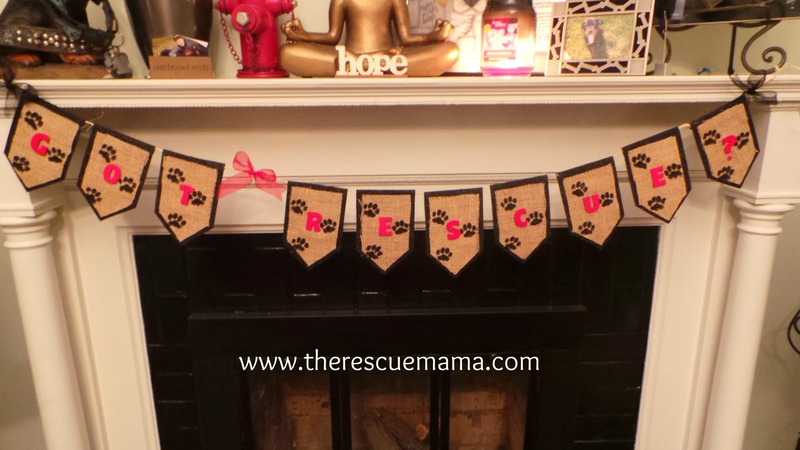 I used a large paw print stamp to make my end banners. 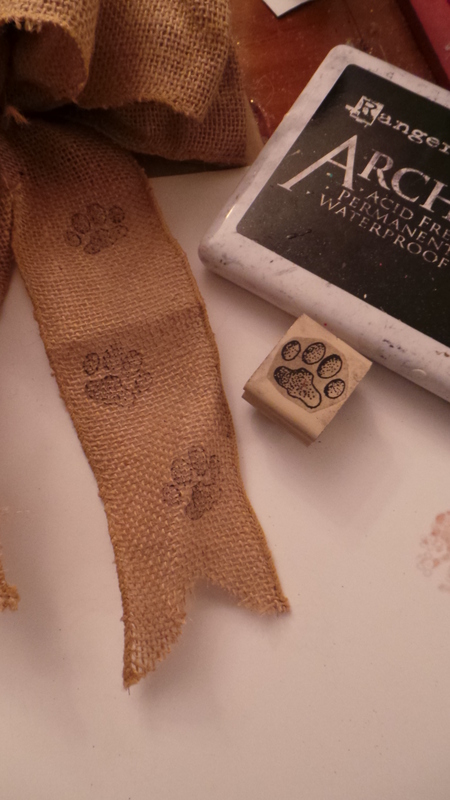 I stamped the paw prints with archival ink and then went back over the stamped image with paint. When my banners were dry I flipped them upside down on my craft mat (important to use a craft mat underneath). 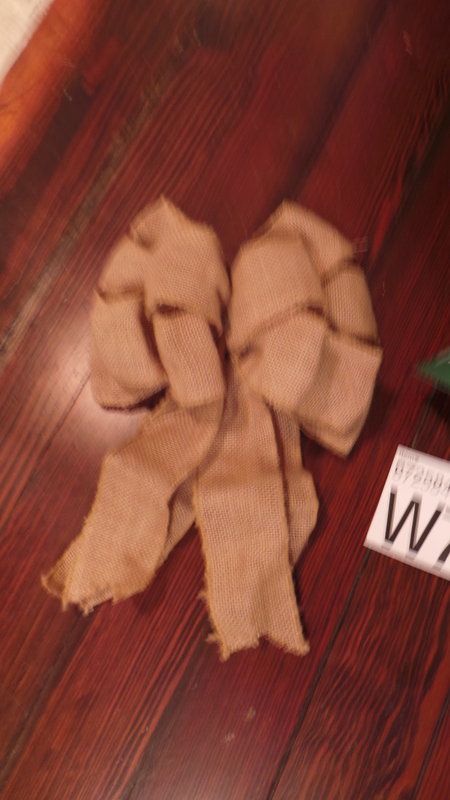 I ran my twine across the back and covered the crevice behind the twine with hot glue, folded the burlap over the twine and held it down until the glue was cooled. Measure the space between each flag as you glue it to the twine for an even look to your finished project. Once your glue is cool, trim your folded edges so they look neat and tidy. 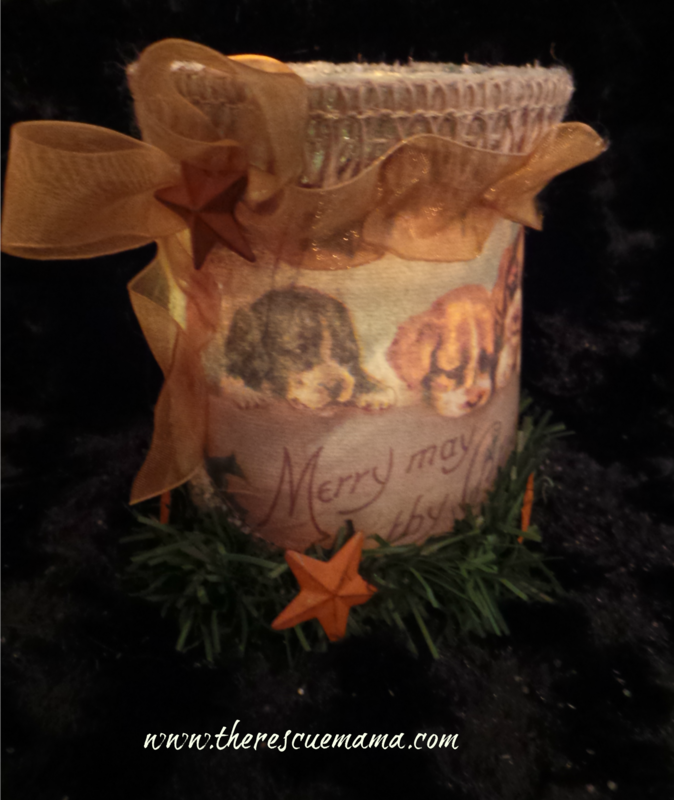 To address the fraying of the burlap and make this a lasting project I used Mod Podge. For this project I used Matte but you could use Gloss if you want. I set my banner on my craft mat (important to reduce the mess). 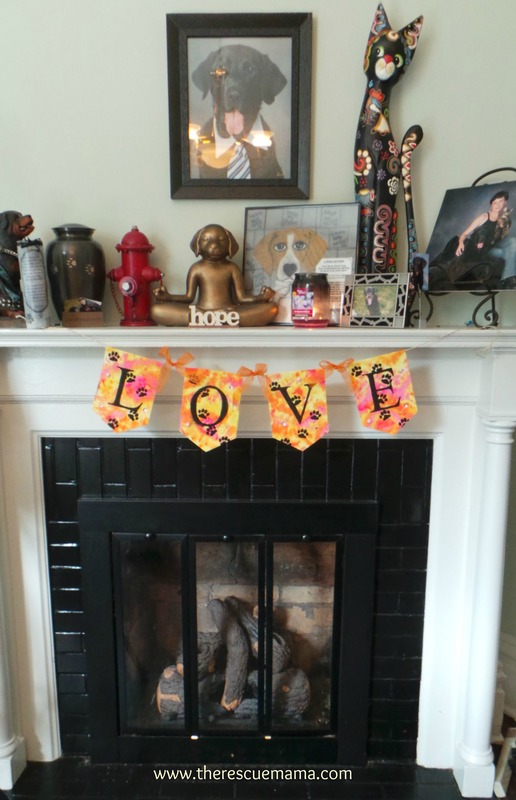 I used a very generous amount of mod podge applied with sponge to each banner and then I hung it to dry over night. 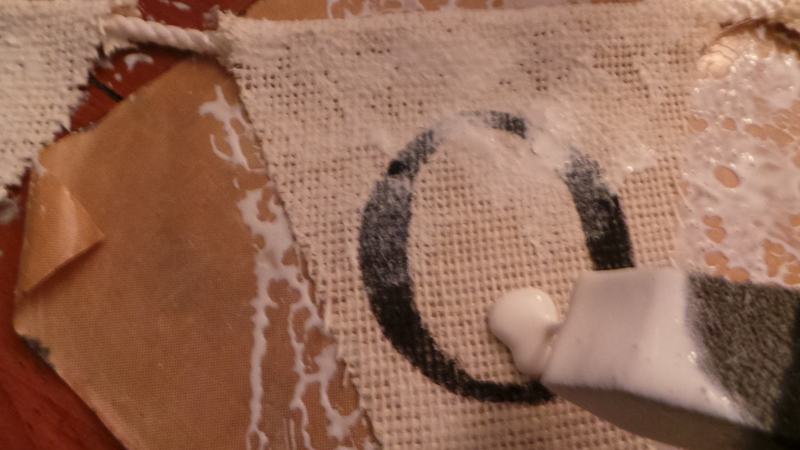 It is only necessary to apply the mod podge to one side with burlap. The flags of the banner may curl a bit after the mod podge dries. To reflatten the banners I set them on my ironing board, put a piece of card stock over them (important) and gave them a quick iron. 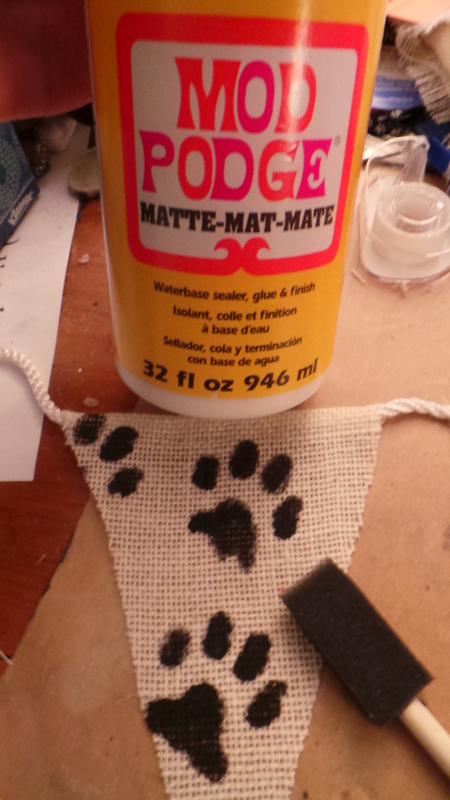 To finish off this banner I added some paw print bows; I tied them first and then hot glued them on. My second banner was my love banner. 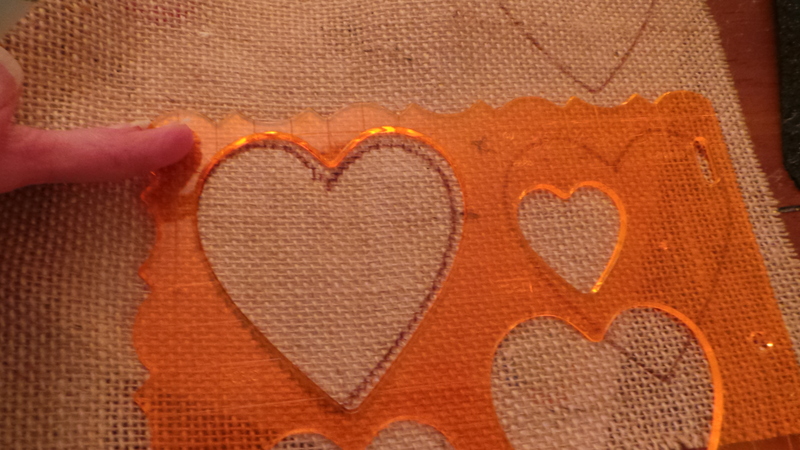 Here is the template I used to make the pattern: LOVE Banner Template. 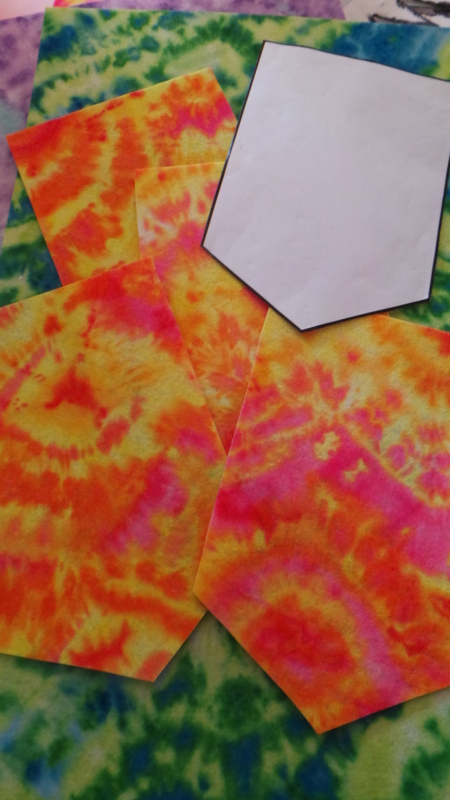 The banners are made from stiff felt that I purchased at JoAnne’s, it comes in a variety of tie die color themes. I just love this pink and orange…so girly! 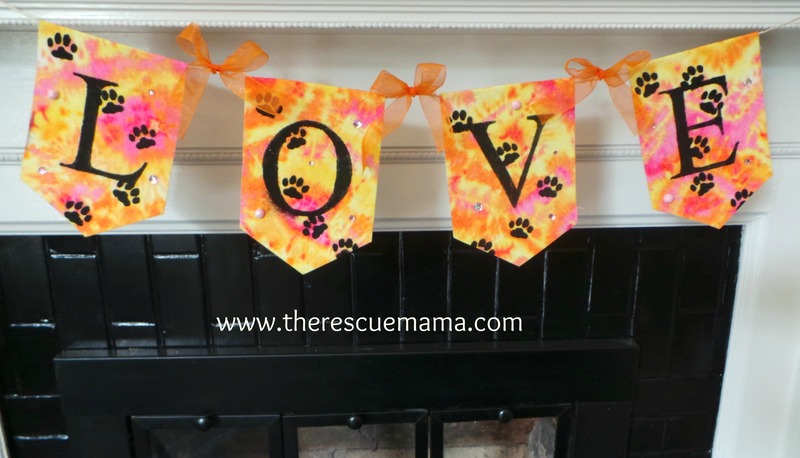 I did the same process with letter stenciling on these banners. 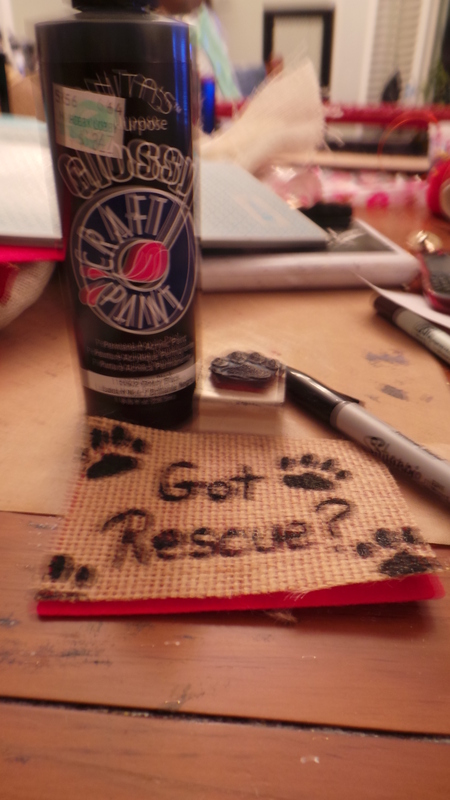 I used a smaller paw print stamp but followed the same process as the WOOF banner; stamp with archival ink and then paint over it with craft paint. I added some pink gem stones to the banner and some orange bows to finish it off. My last banner is my Got Rescue Banner. Here are the templates I used to cut the banners: Got Rescue Banner. The back piece of the banner is made from stiff black felt and the front from brown burlap. 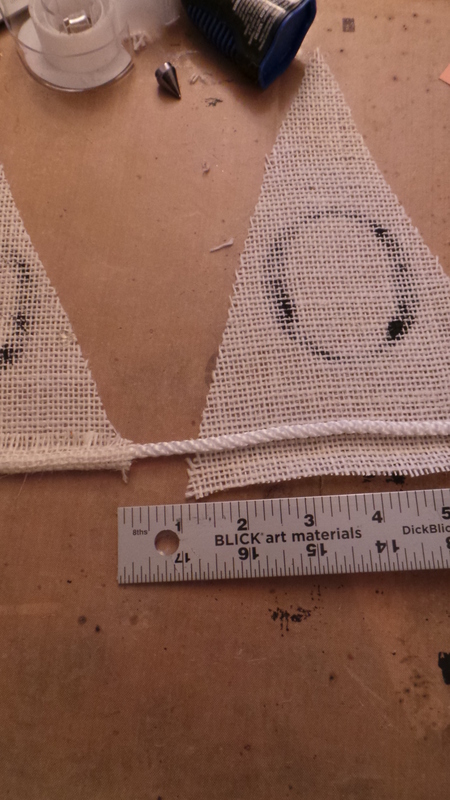 I cut both my banner shapes and then hot glued my burlap to the felt right away (I did each one as I cut) to keep my burlap from fraying. 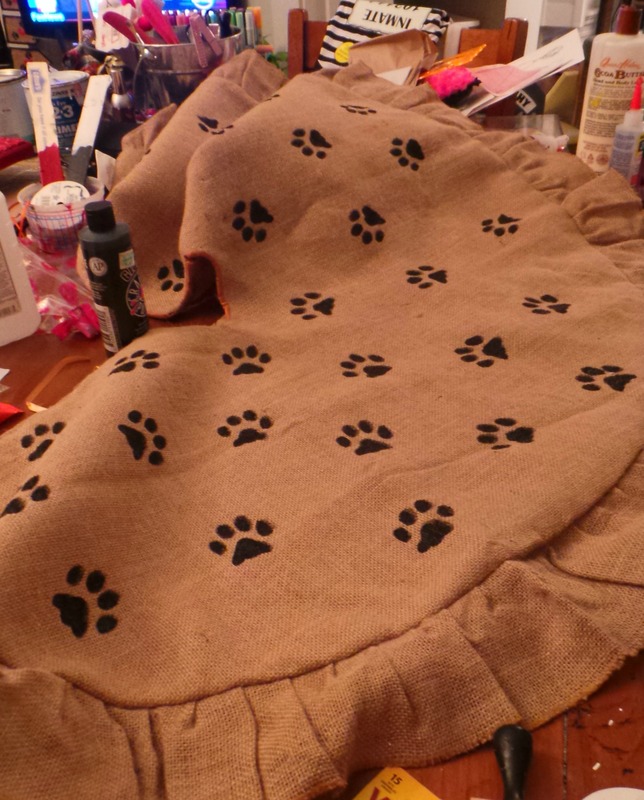 Before I glued each piece of burlap down I ran an iron over it to make it nice and flat. 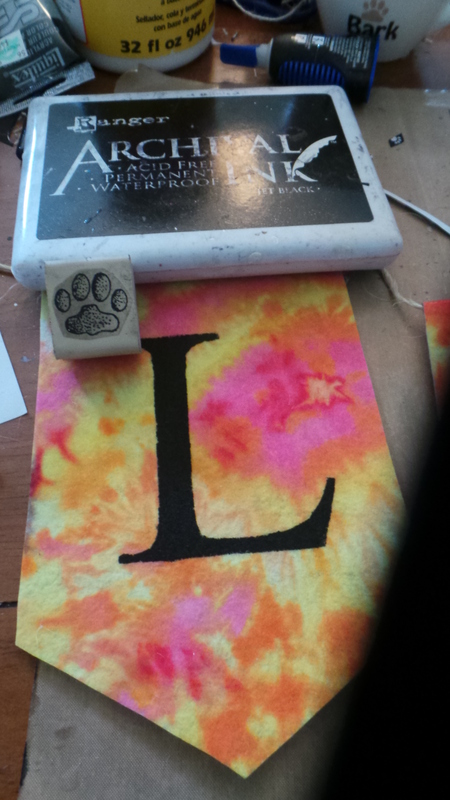 I used a paw print stamp and archival stamp pad to make my paw prints (again going over them with paint) . 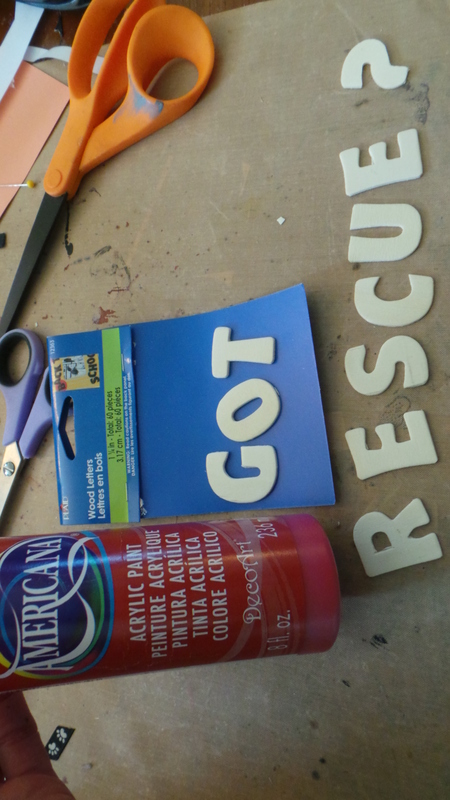 To make my “Got Rescue” letters I used some wood letters that I purchased at Walmart and painted them with red glossy craft paint. . To make the question mark I flipped an “S” backward and cut part of it off. If you are an animal lover consider following my blog for pet news, Pet Rescue Art and free tutorials for fun projects for you and your pet. I post 1-3 times per week on my blog and daily on my Facebook and Pinterest pages. 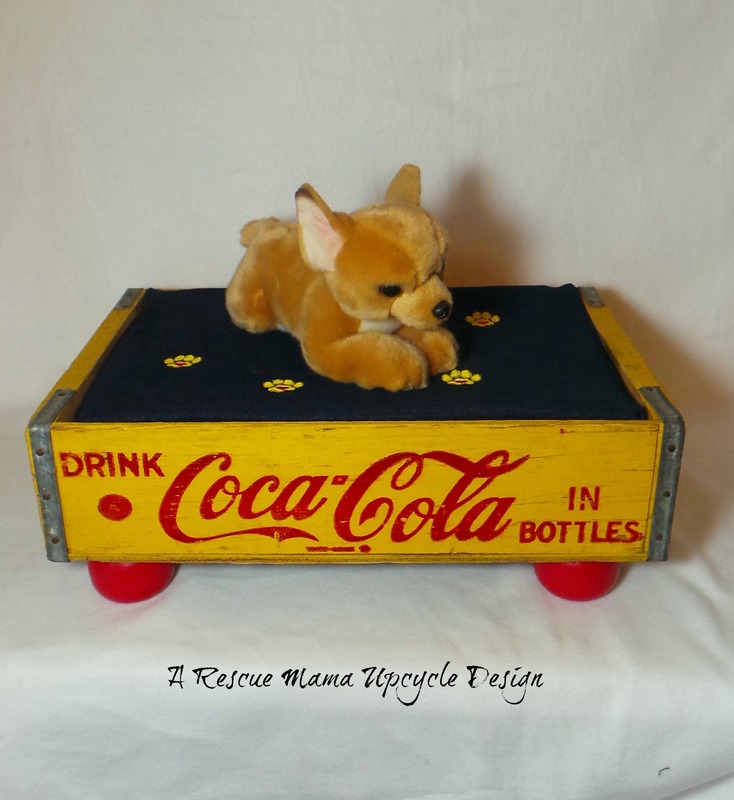 Pet Craft – Upcycle an old Coca Cola crate in to a pet bed…. 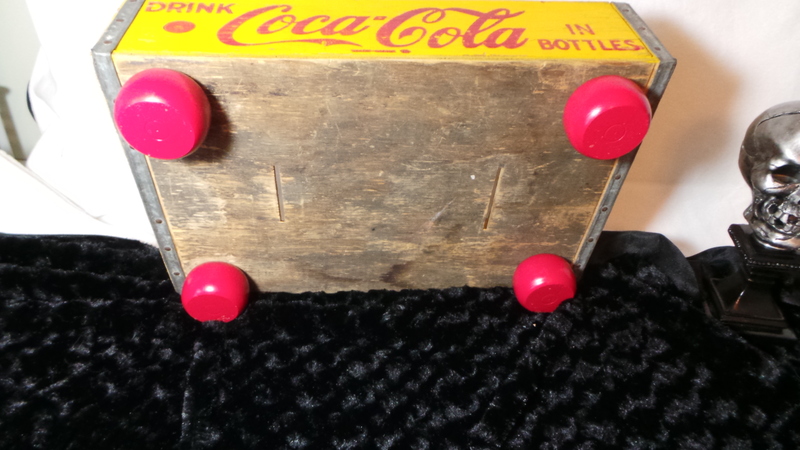 When I am upcycling something iconic like a Coca Cola crate I tend to leave the base item pretty much alone other than cleaning it and making a safety check for tacks, nails or sharp pieces of wood. 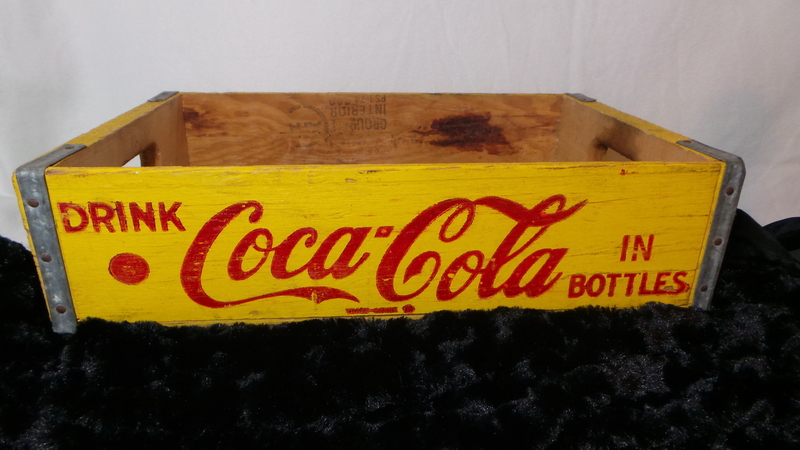 This crate was pretty old (it was stamped 1971) but in spite of its age the paint job was in pretty good shape. Be careful washing something like this; I use Dawn and rub very gently so I don’t remove any more paint than has already aged off. I added bun feet to the bottom of this bed…I add them to most beds…its such a nice finishing touch. You can buy bun feet at most home improvement stores. They are a bit spendy so next time you are tossing away something old that has bun feet on it…take them off for your next project! 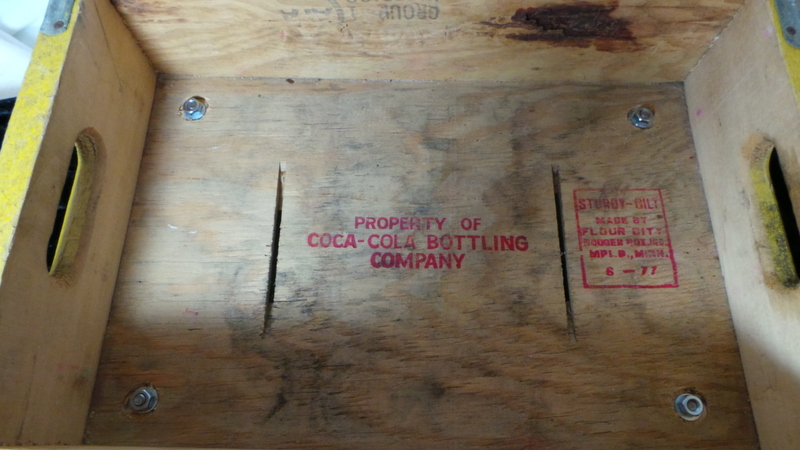 My husband drilled the holes such that the bolt for the feet would be sunk down in the base of the crate. 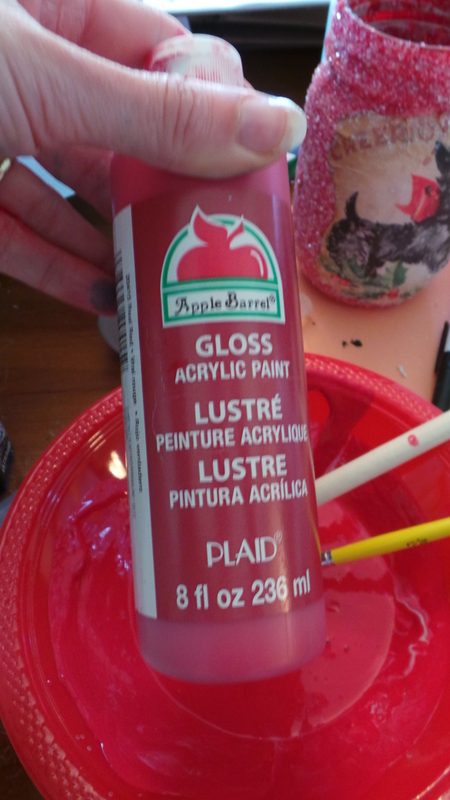 I painted the bun feet with primer and then red craft paint (glossy). To get the cleanest paint job I can (no brush strokes) I use my artist level paint brushes …its a bit spendy but I get a much nicer finish. I use artist level paint brushes on pretty much any piece of furniture I paint. Working always in one direction keeps the brush strokes away too. My preferred material for cushions in pet beds is High Density Smart Foam. Its mildew resistant, flame resistant, holds its shape and is super comfy. You can find it at Hobby Lobby but it is a little spendy (wait for a coupon). I buy it wholesale or it would not be practical to use it in beds that I sell. I cut the cushion first based on the size of the box. The best way to cut this foam is with an electric knife (like you use to carve the turkey). Once I have my cushion cut I measure the cushion for the cover and add 1/2 an inch to each side and piece I need to cut to make a pattern. 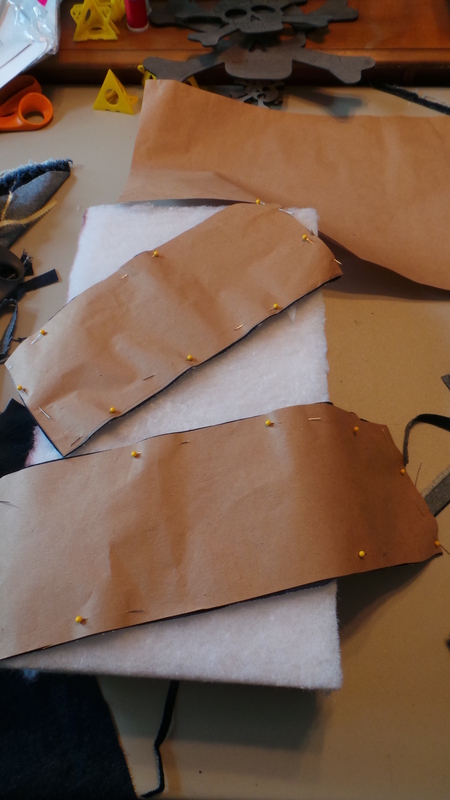 I always make my pattern on paper first and test it around my cushion before I cut my fabric. 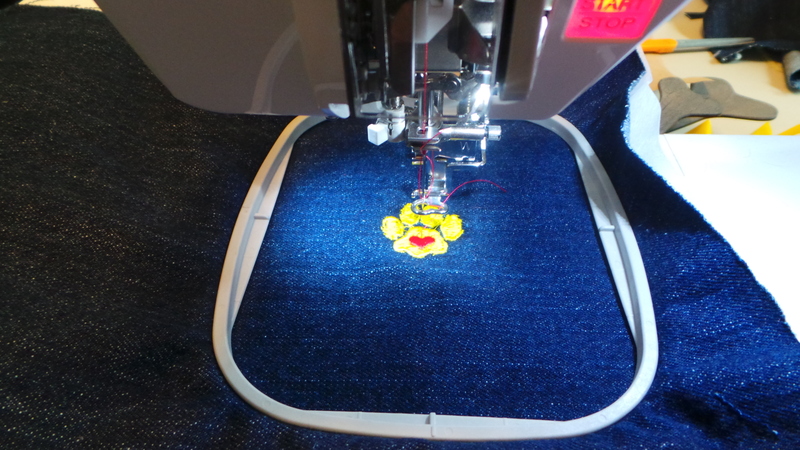 I sew the cushion together inside out on all sides but for one last opening which I sew Velcro in to. It just seems impractical to have a dog bed you can’t pull apart for washing or replacing the cushion if necessary (accidents happen often with pets…or just drool over time). 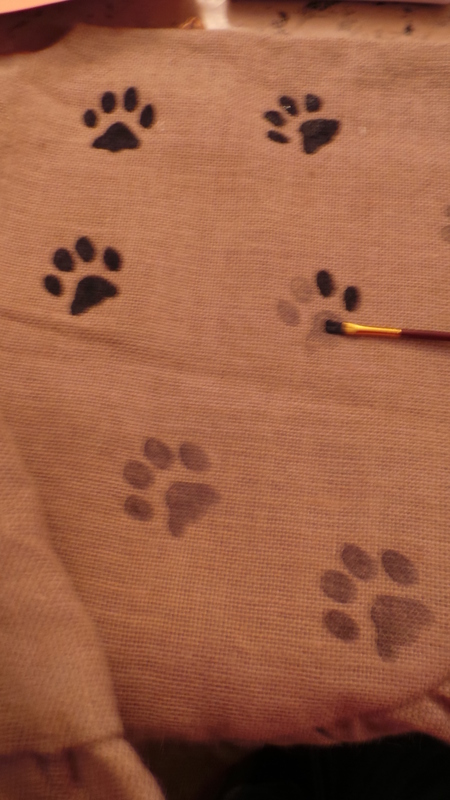 For this cushion cover I embroidered paw prints randomly on the top piece (BEFORE I SEWED IT TOGETHER). I found this particular design on the Dakota Collectibles website (shop on Friday’s – good deals). The cushion could easily have been embellished with iron on pieces or non-toxic fabric paint, etc. Once the final cushion cover is assembled stuff the cushion in and Velcro it closed. Waa laa! I had a blast making this bed…enjoy! 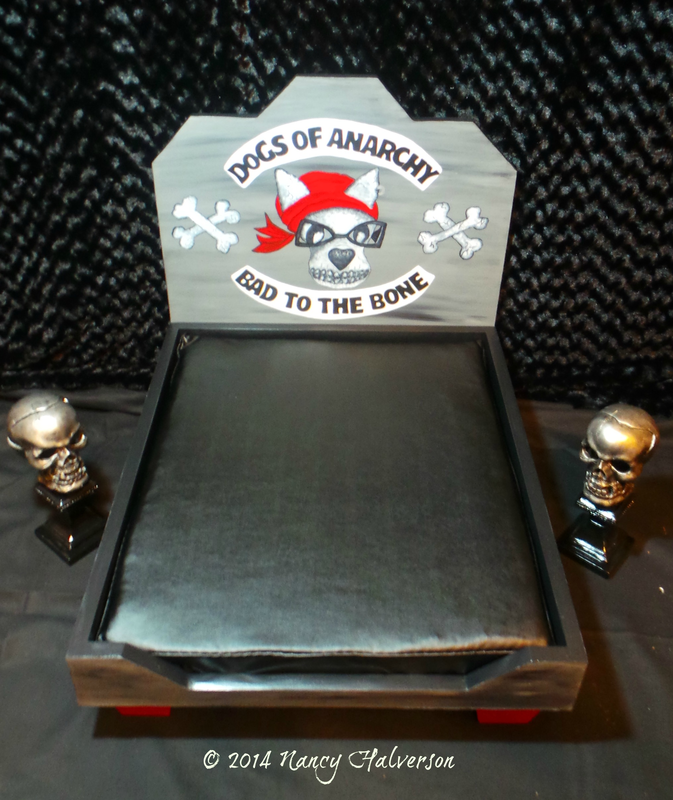 If you interested in purchasing a pet bed feel free to browse my selection on my ETSY shop, use the coupon code “NEWCUSTOMER” for 10% of your first purchase. Looking for inspiration for your own dog beds or pet crafts…check out my Bed Gallery and Craft Page! 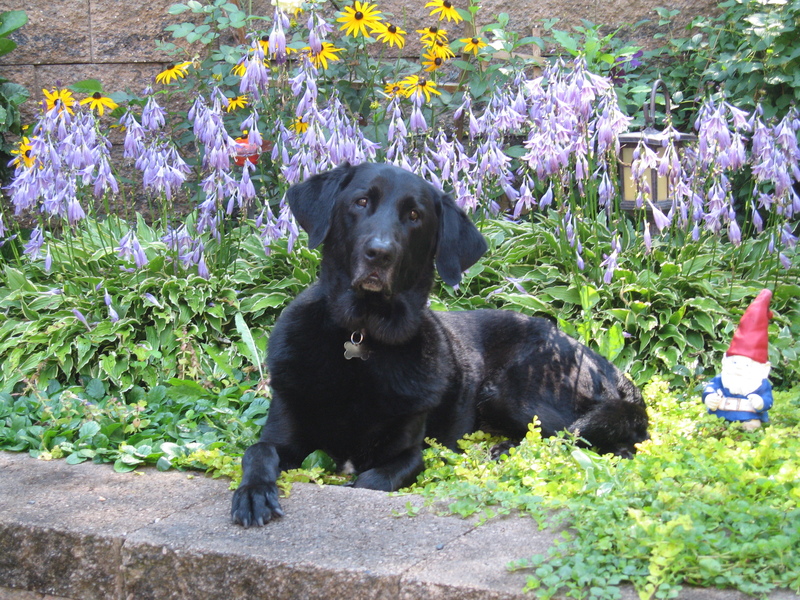 If you love all things pets …feel free to follow my blog. 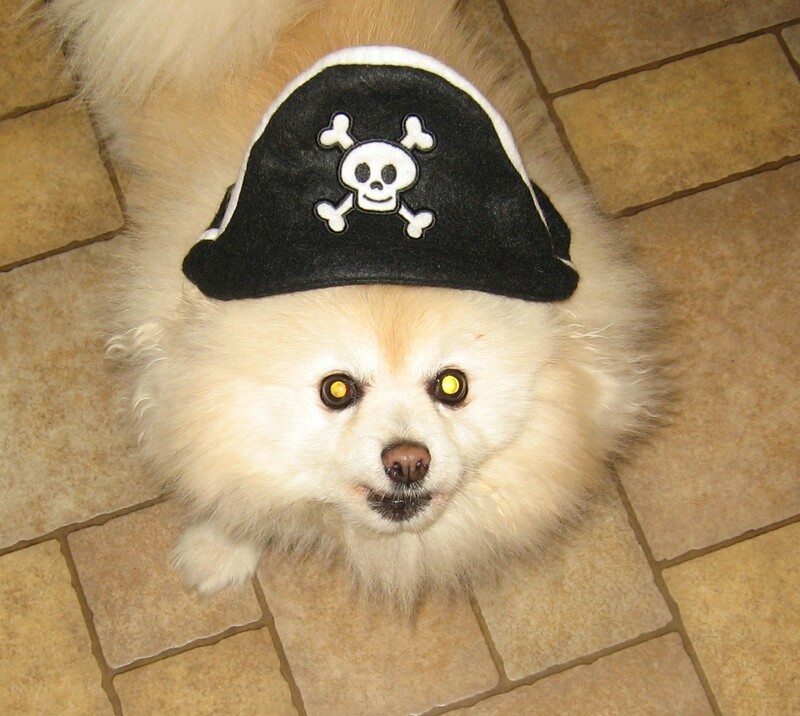 I post 1-3 times per week on pet care, pet crafts, pet rescue, pet art and more. I post daily on my Facebook and Pinterest pages. Happy crafting and Rescue On! 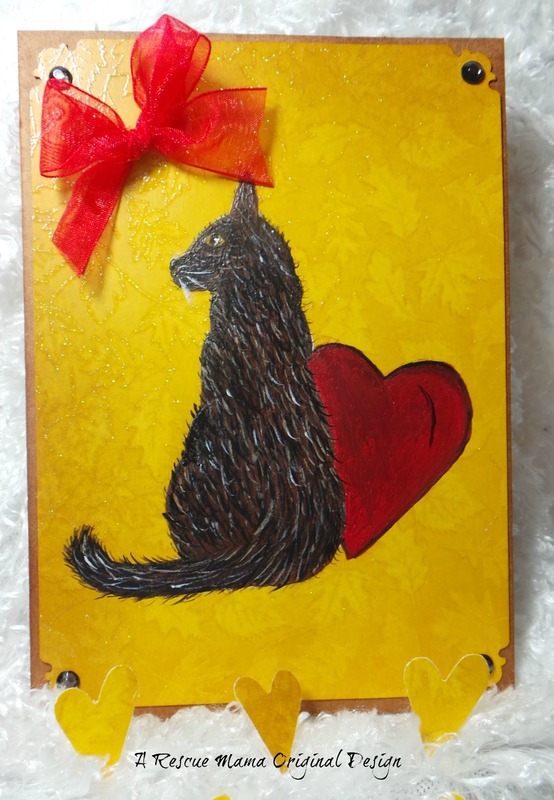 Pet Sympathy: new designs for hand painted cat sympathy cards! 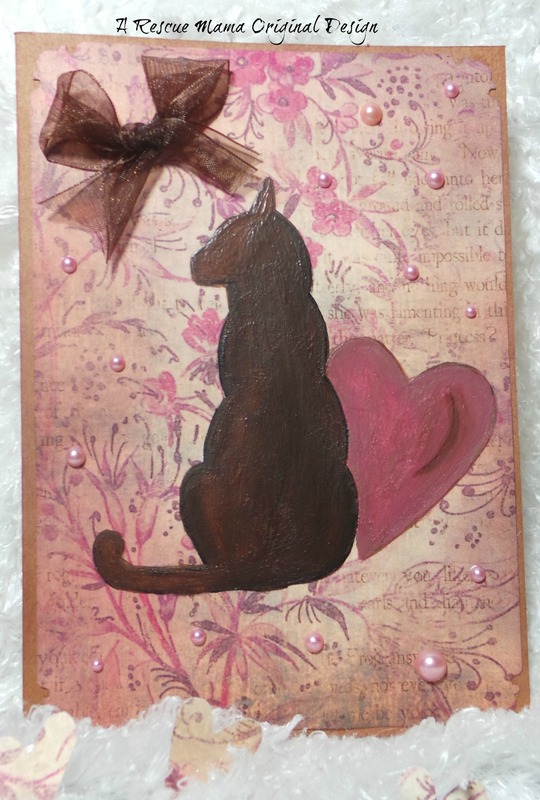 I have fallen in love with this cat silhouette on these cards…so much so that I went a little crazy a few weeks ago painting a series of different backgrounds. 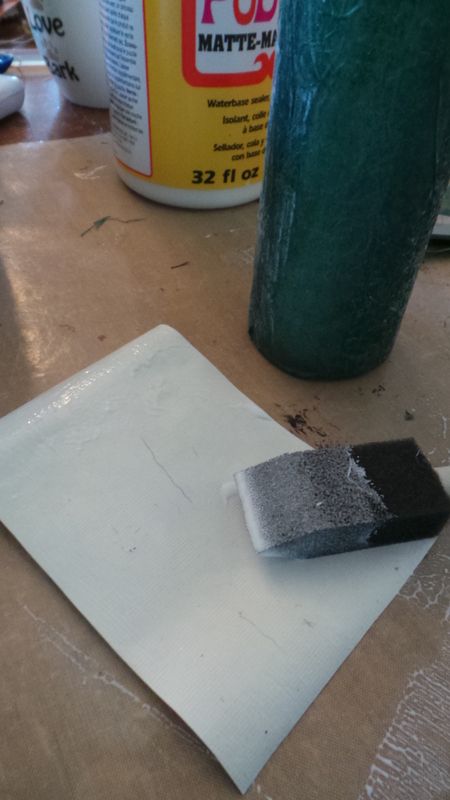 All it takes to paint on all this lovely card stocks is start with a layer of Gesso. The card stock is acid free so the painting will be lasting. I had a lot of fun with these and have started on some other silhouettes to use in the future. I think the next one will have angel wings:) What do you think? Most of my cards are available at my ETSY shop. I do give discounts to pet professionals buying multiple cards. Looking for ideas to inspire your own card making…check out my Card Gallery! 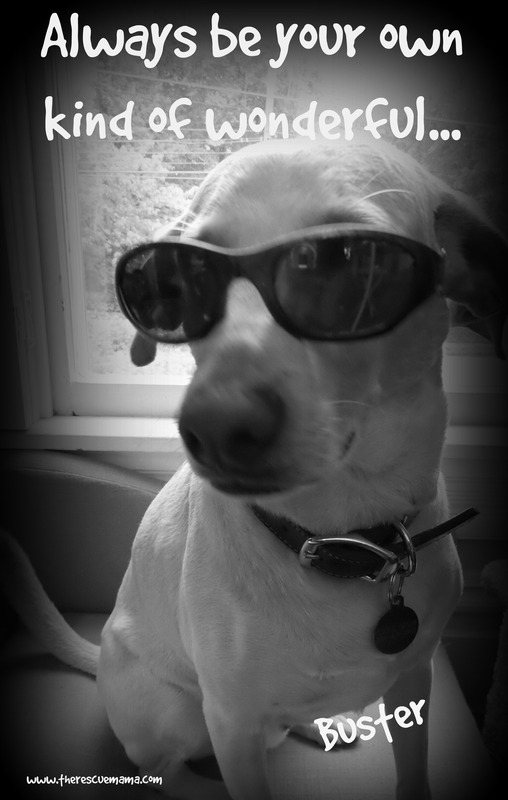 If you love all things pets follow my blog for pet news, art and crafts! I post 1-3 time per week on my blog and daily on Facebook and Pinterest page. 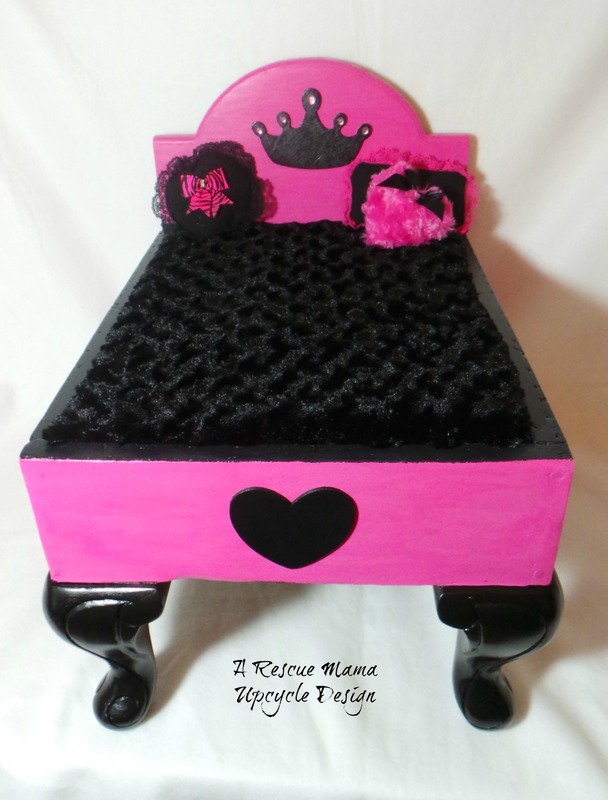 Pet Craft: Princess Pet Bed upcycled from an old foot stool! I made this bed from an old foot stool I picked up at a junk market. When I purchased it, it was just the base and legs. My husband did a safety clean up (pulled out nails and tacks) and made me a little head board. I painted it up, made a custom cushion and pillows and added some embellishment. I make cushions out of Hi Density Foam; it is washable, flame resistant and super coooooshy! I covered the cushion with a super soft and yummy faux fur. 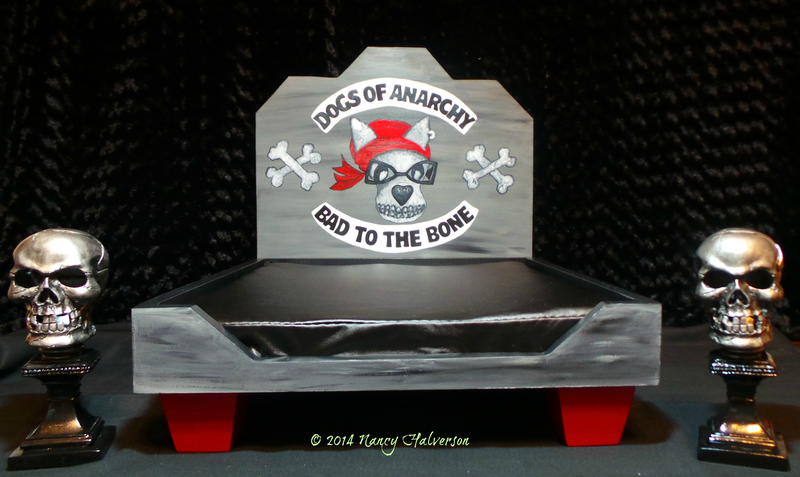 When I painted this bed I used Glossy Black paint. The pink paint I could only find in matte so I finished it off with some gloss varnish. 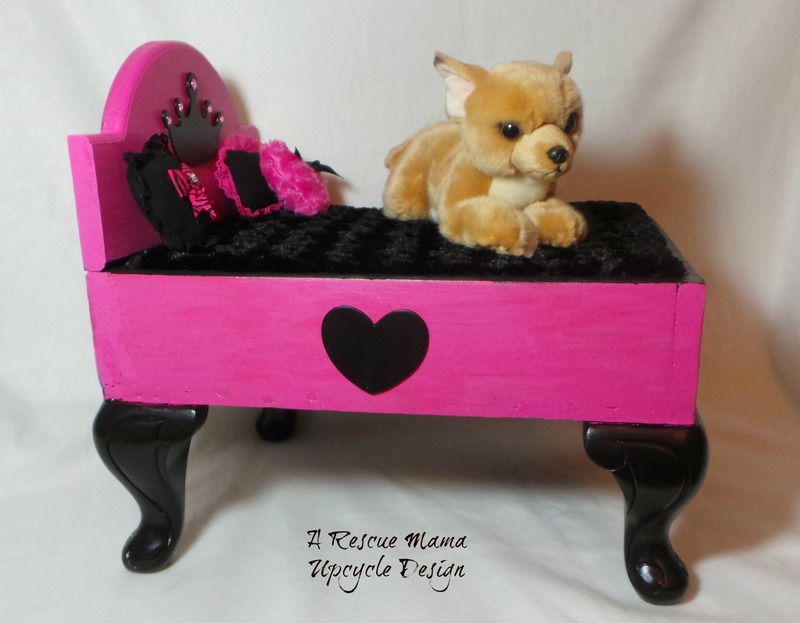 This is perfect for a small dog or cat that needs her own little princess bed. What do you think of this bed? 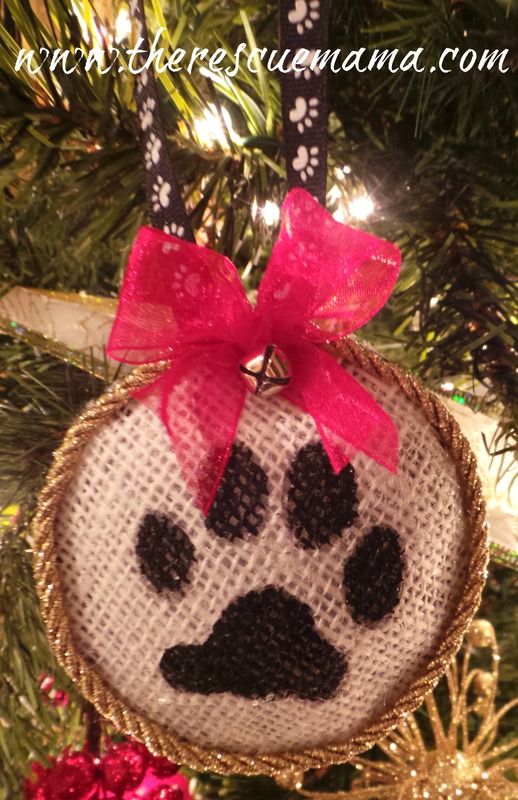 Check out my Pet Crafts page for free Craft Tutorials! This and other bed I made are available for purchase at my ETSY shop! 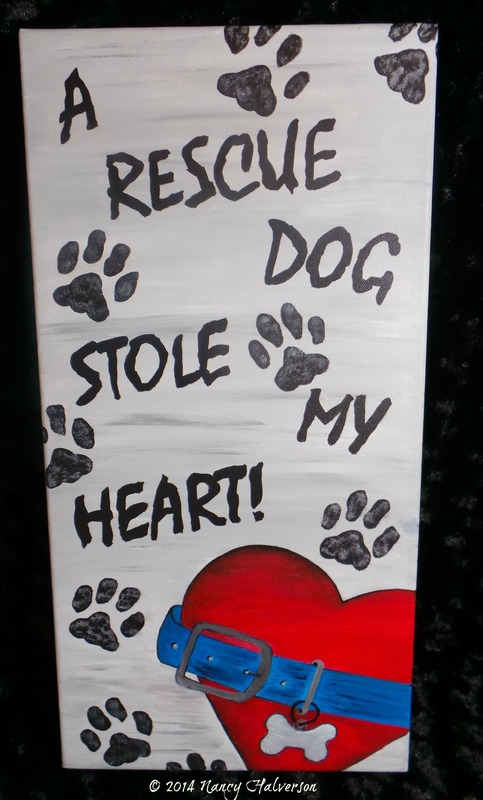 Pet Rescue Art: A rescue dog stole my heart! 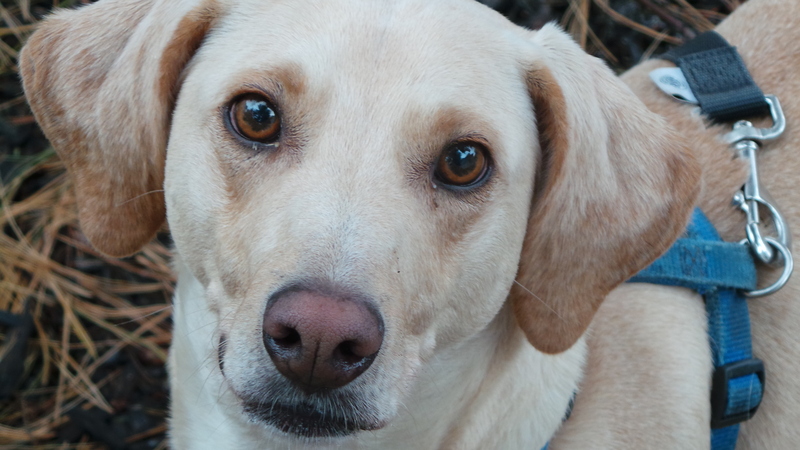 My heart has been stolen by a rescue pet exactly seven times …how about you? I just posted this new painting to my shop…what do you think of this one? This bee box has gone to the dogs! 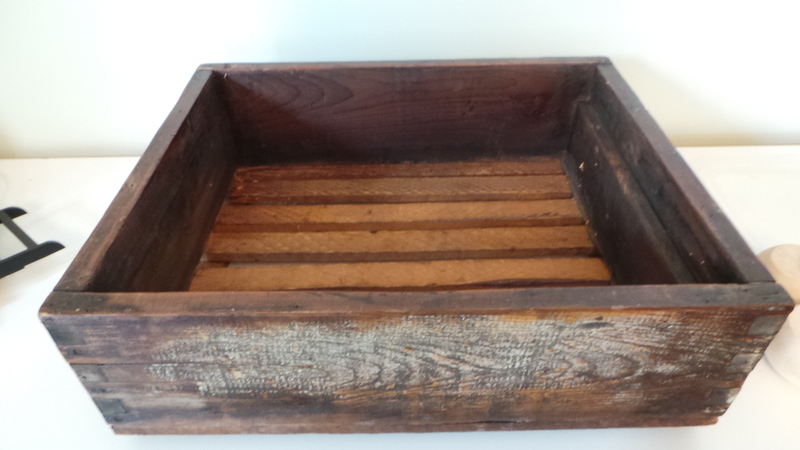 Antique Bee Box made in to a pet bed! I had an absolute blast making this pet bed. It would work for either a small dog or a cat (or frankly even for a doll bed). I am flush with pet beds in my house so this one is going up for sale on my ETSY shop. What do you think of this one? Looking for ideas to make your own beds?…check out Bed Gallery and Craft Page! 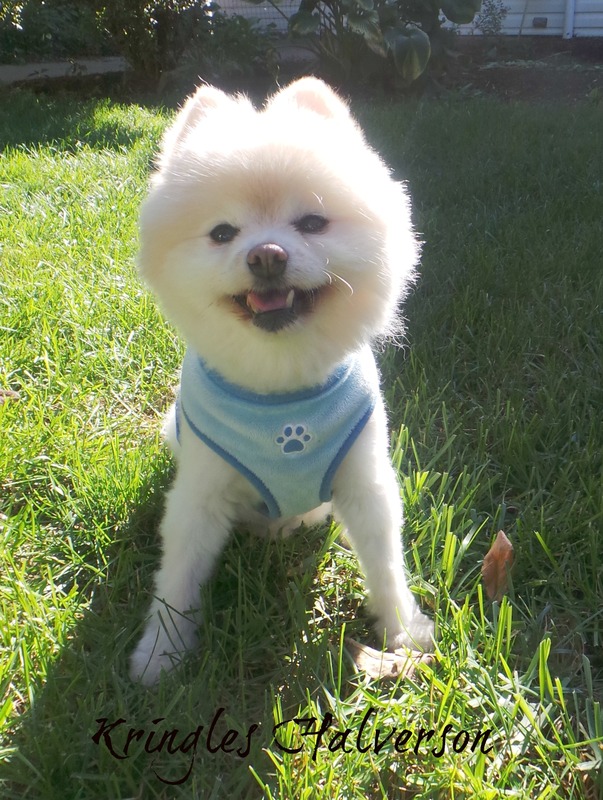 If you love all things pet subscribe to my blog… I post 1-3 articles per week on my blog and daily on my Facebook and Pinterest pages. 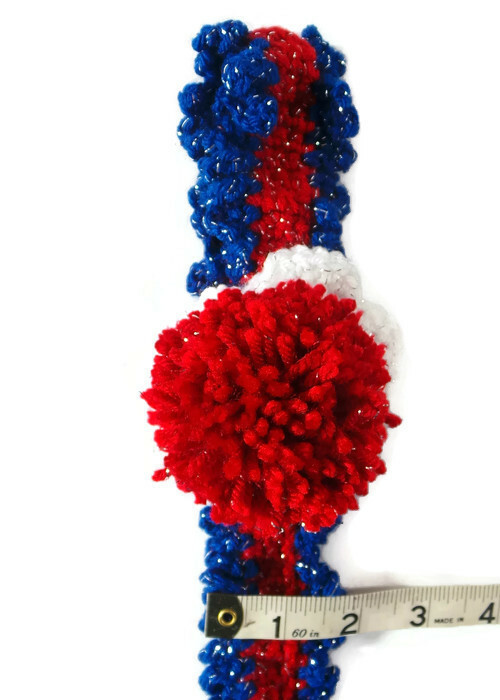 How do you like my new leash designed for the patriotic dog? Dogs can be patriots too! I just finished this leash and Kringles will be wearing his on Memorial Day weekend! 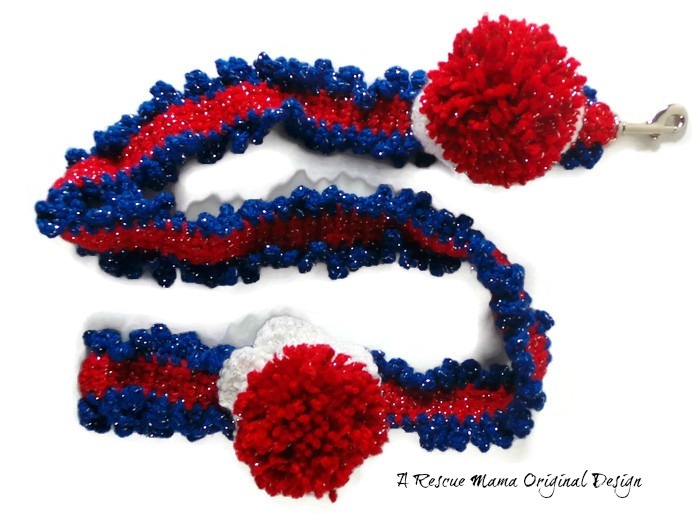 This leash is 36 inches long and made from a heavy duty but sparkly (silver sparkles) yarn! 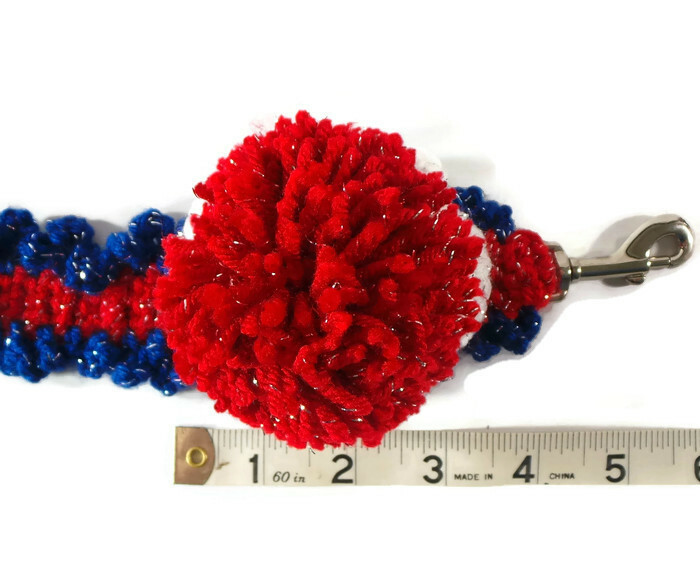 Both ends of the leash are highlighted with a crochet flower with a red pom pom in the middle. The snap hook I used on these is a 2 inch swivel. There are two jingles bells sewn under the flower by the snap hook – because why shouldn’t a dog with style make a little jingle when they walk? 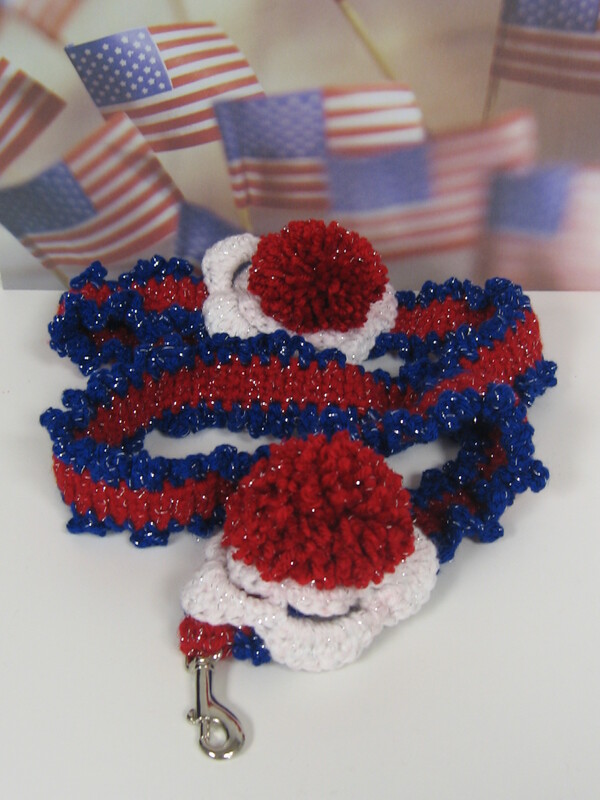 If you do your own crocheting here is a basic tutorial for how I make these leashes Crocheted Leash Tutorial, if not they are available on my ETSY store.